Border crossing experience entering Georgia: “Passports please”…..WHACK! STAMP! “Welcome to Georgia.” No visa, no questions, no money…Almost felt too good to be true. We entered Georgia with high expectations. Most of the overlanders we had crossed paths with while in The Stans who were coming from West to East had passed through Georgia and they all told us we were in for a treat…nice people, amazing scenery, rich culture, and good food. What did we find in Georgia? Keep reading to find out. We entered our first Christian country in 8 months – I ate a ham sandwich and washed it down with a gulp of red wine. 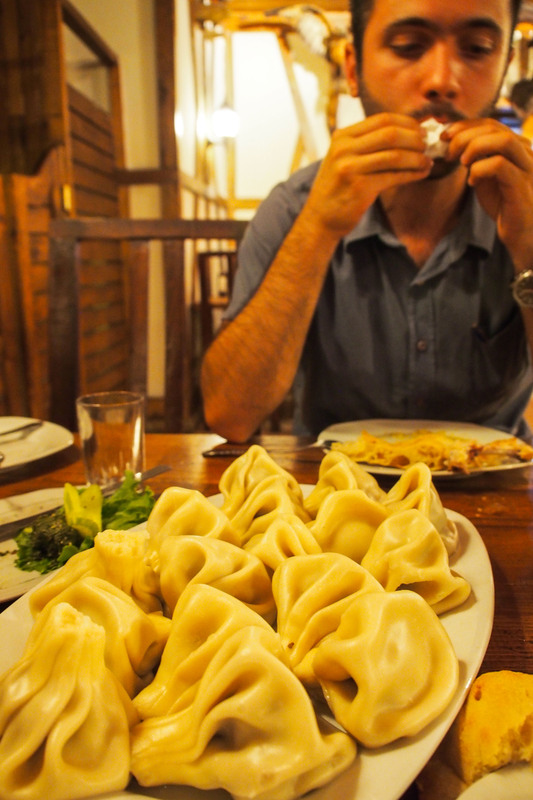 We spent more than a week in Tbilisi (Capital of Georgia), hogging out on Georgian food, kinkali (meat filled dumplings), lobio (bean soup) Abkhazian (garlic and walnut paste spread onto fried egglplant), and Katchapuri (warm buttery bread stuffed with cheese). We wondered if we liked it all so much because it really was actually good or just because the Central Asian food we left behind was just that bad. We made friends with a funny Georgian mechanic named Nico in Tibilisi who helped us located some parts for Bala. We saw entire towns that had been completely abandoned. Factories, shops, churches and homes with smashed windows and trees growing out of them. 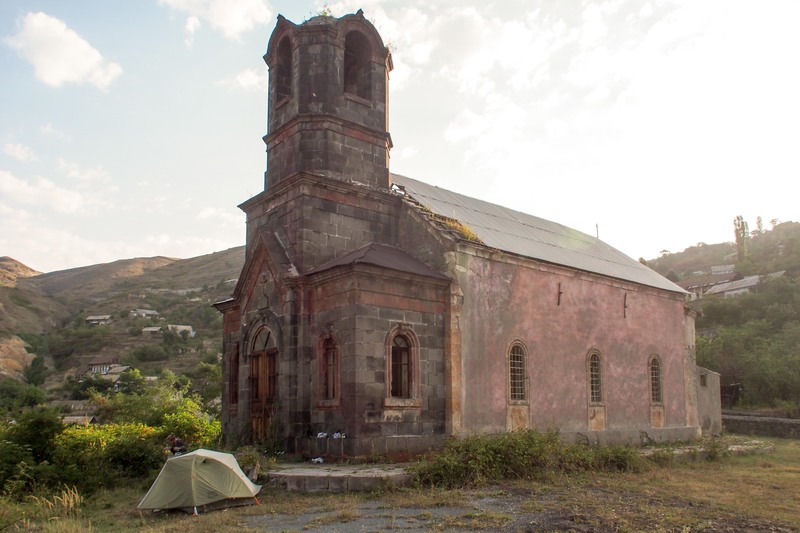 We woke up on the steps of a old abandoned church surrounded by an abandoned town. We found the people to be incredibly friendly. See next line. We got a flat tire near an old church. First a priest shows up and offered his help holding Bala on her side so I can work off the tire. Little while later he returns with two cold drinks. Then another guy shows up and offers us a tire pump. 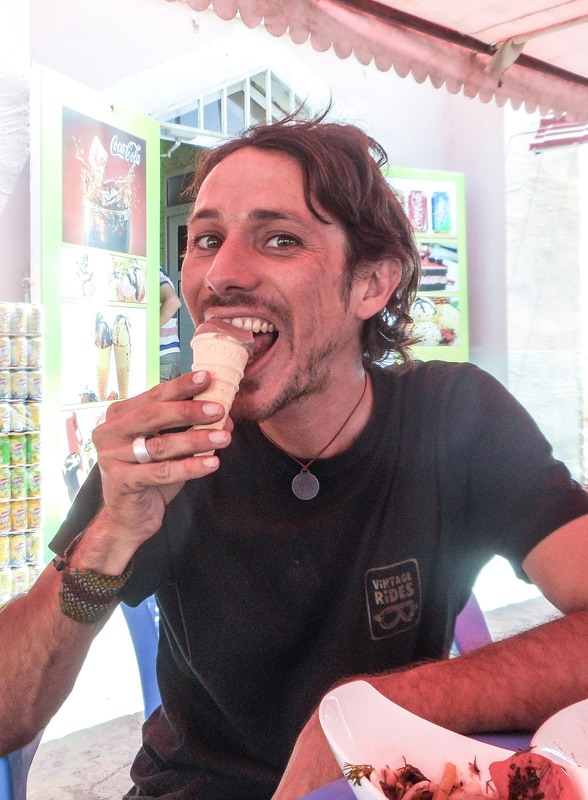 Then the priest returned again with 3 ice creams, I took a break from the bike and the three of us ate them together. He takes off again. Then another guy comes over with a bag of plumbs from his garden, around the same time the priest returns with two peaches, and the bike pump guy also returns…this time with a few handfuls of mulberries. Somewhere in between all this a couple also showed up in a car and offered to invite us for a beer. Finally the priest returned one more time with soap to wash our greasy hands. Our tent, parked in front of an abandoned church in an abandoned town. In front of an 800 year old ruined fortress off a small highway in Southwestern Georgia some 150 kilometers from Tbilisi, by complete coincidence we bumped into Nico, our mechanic friend who we had said goodbye to a week before. We formed a little motorcycle gang and spent the next few days traveling together and enjoying each others company. I learned that archaeologists always throw something into the remains of a dig when they are finished…a handful of coins with current dates on them, a plastic toy, or any other anachronistic item that would alert future scientists that the site has already been examined. Our new archaeologist friends humored me with a small request…. and now, a part from Bala’s carburetor rests next to what was once an 8,000 year old human dwelling. 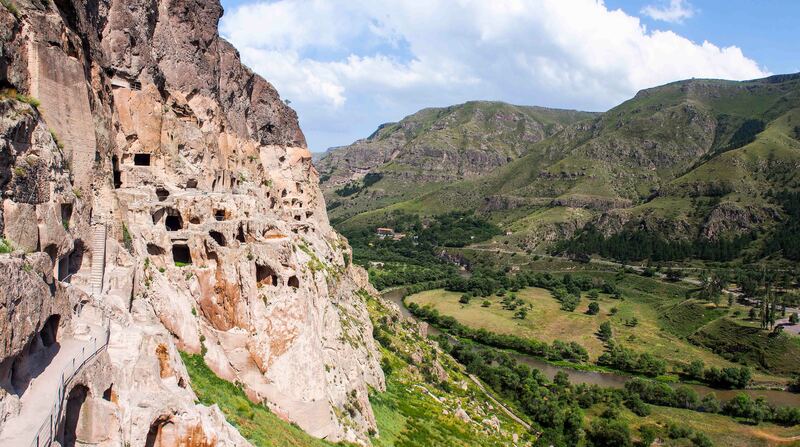 We explored a 900 year old monastery that was carved into the side of a mountain overlooking a beautiful valley with a river winding through it. Imagine a small town consisting solely of hand carved caves, over 400 rooms total that once included a bakery, a pharmacy, 25 wine cellars, and 12 chapels complete with beautiful frescoes painted on the walls. We learned that Georgia is where it all began…the earliest archaeological evidence of grapes cultivated for the production of wine that was ever found was in Georgia and dated to around 6000 BC. We met a guy who recruited the help of several of his friends and drove us all around town to help us fix a part on Bala that had broke, he wanted no money for it. Once when Bala broke-down, a man invited us into his home, we spent the night at his house, he treated us to lunch and then to dinner, offering to pay was not an option. The next morning we woke up at his home to a huge breakfast that he had prepared and served to us on a tray. We met a man who closed down his small air-condition repair shop for the day so that he could take us to a nearby thousand old church and monastery and give us a full tour. We met a man who has dedicated the last 8 years of his life to the church, who has aspirations of becoming a monk. He believed in being kind to strangers. 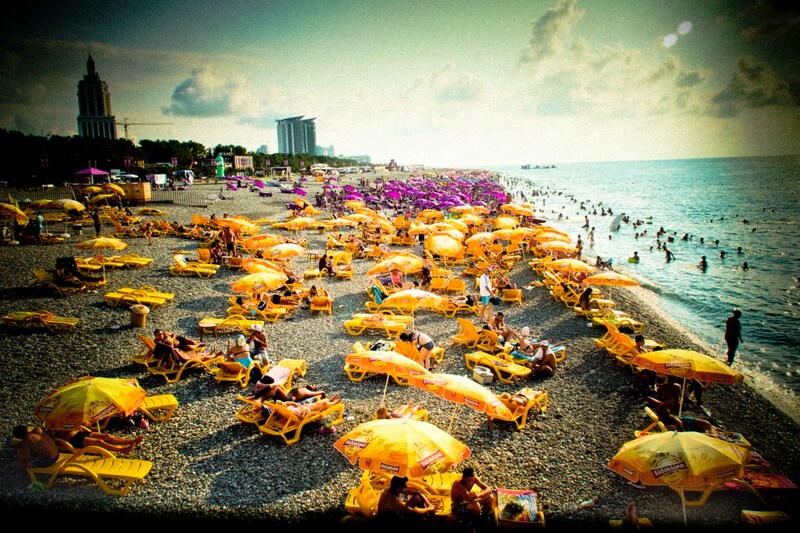 We spent some “vacation” days in the resort town of Batumi on the Black sea. We gambled in a casino and treated ourselves to a fancy dinner. We started chatting with a man next to us, he was interested in our story. It later came out that he was the owner of the restaurant and after he excused himself to go back to his table of friends the waiter came over with two glasses of wine on the house. We got into a shared car to get to a remote mountain region in the north of Georgia. The driver insisted we come first to his home before hitting the road, where we were served food and he served himself a few shots of vodka before we hit the road. We fell in love with the Georgian alphabet. 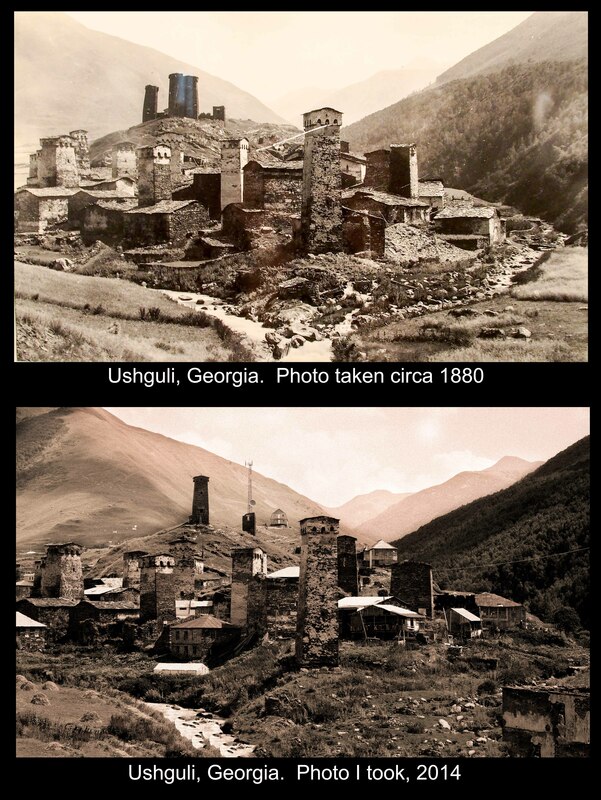 აქვს ლამაზი დღე ჩემი მეგობარი I just wished you a nice day…in Georgian. Remember the guy we hung out with for a couple days who had spent years in prison for murder? That is the same guy who helped us fix the part for Bala, who invited us into his home, served us breakfast and treated us with the utmost kindness, the same guy who closed down his shop so that he could give us a tour of the nearby historical churches and monasteries, who has dedicated himself to becoming a monk. His name is Shalva, we will never forget him. 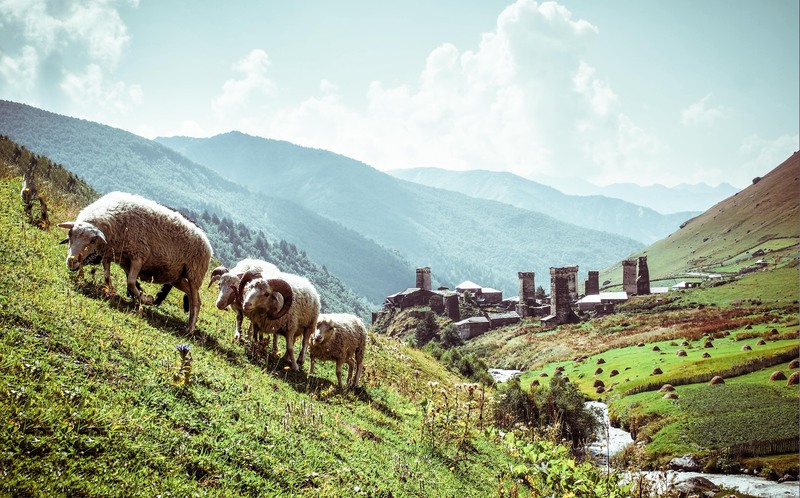 We fell in love with Svaneti, an isolated mountainous region in the north of Georgia, one of the last living medieval cultures left in the world. It is wild, untamed, mysterious, and stunningly beautiful. 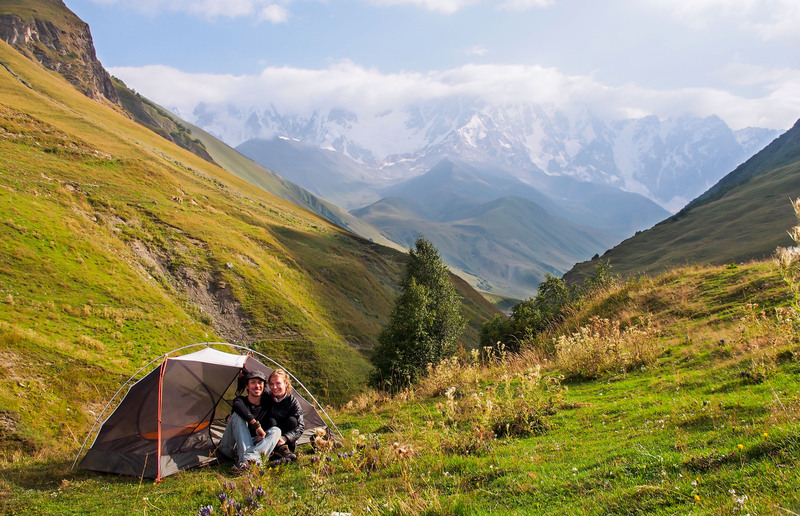 We hiked and hitchhiked for several days through Svaneti, from Metzia to Ushguli. We stayed with a family in old stone villages surrounded by 5,000 meter (17,000ft) peaks and dotted with ancient defense towers, we camped next to glaciers, we camped next to ruined old stone structures, we crossed rivers on horseback, we saw and photographed more than 40 different wildflowers, we made friends with cows and dogs, we drank vodka in our tent as we listened to the sound of a raging glacial river, we hitched rides from policemen, road workers, and polish tourists, we didn’t want to leave. 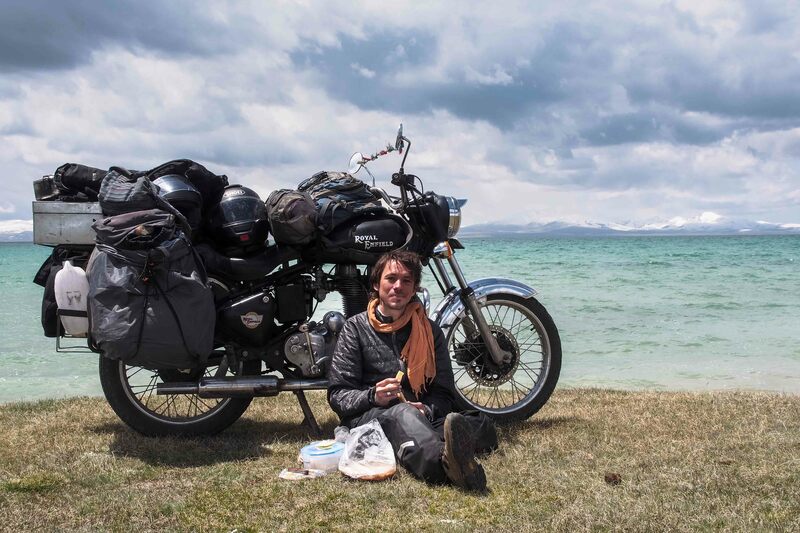 Luckily our part finally arrived from India, thanks once more to the guys a Vintage Rides, and so we were able to shove off, towards our next destination, to cross yet another border…to see what adventures await us in Turkey. There’s lots more to see!!! CLICK HERE to be taken to an album where you can see many more photos and also read the captions next to them for some more stories. 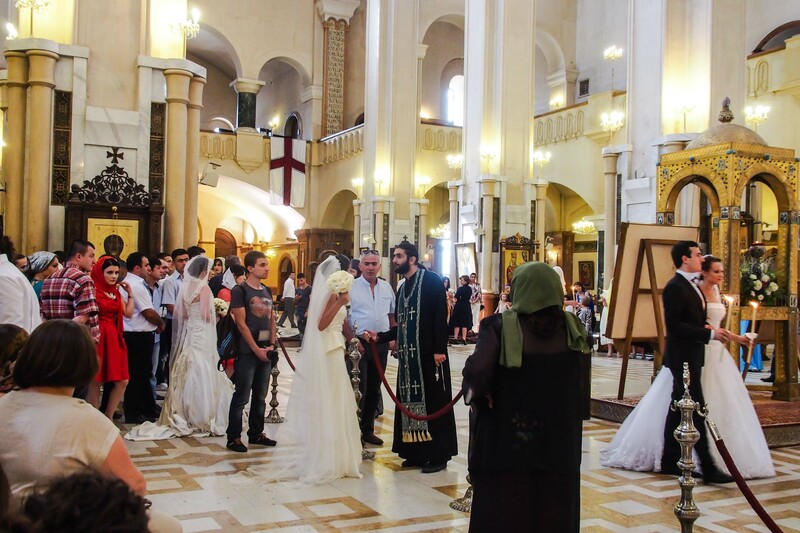 This entry was posted in Uncategorized and tagged armenia, Caucasus, Georgia, mestia, tbilisi, ushguli on April 28, 2015 by Jordan. Border crossing entering Uzbekistan: Searched for Codine (painkillers) and bibles (both strictly forbidden). But everyone was friendly enough. Border crossing entering Turkmenistan (keep in mind we only have 4 days to travel 1300 kilometers across the entire country and were already delayed by a flat tire just 30k before the border, so needless to say we are in quite a rush. ): Arrive at border (after being searched AGAIN for codine and bibles by the Uzbek exit customs), fill out various forms, wait. Wait. Wait. Collect various stamps on various forms from one guy, sent to other guys in army fatigues who send us back to the first guy who sends us back to the Army guys who finally tells us that we need to talk to a third guy (we are now one hour into the process), BUT…(He makes hand to mouth motion), we understand through extensive pantomiming that the entire border crossing is closed now for lunch. Wait on the curb for an hour and a half. Wait. Wait. Hot. Wait. After work resumes, we are drawn a map of the route we will take and explained we are not permitted to deviate from this route. A few more stamps, and some “road tax” payments made and we are on our way. Imagine what it is like to be standing under a heat lamp…wearing an ALL BLACK astronaut suit (protective motorcycle pants, jacket, and helmet…and then imagine you are standing in front of a gigantic very hot hair dryer. 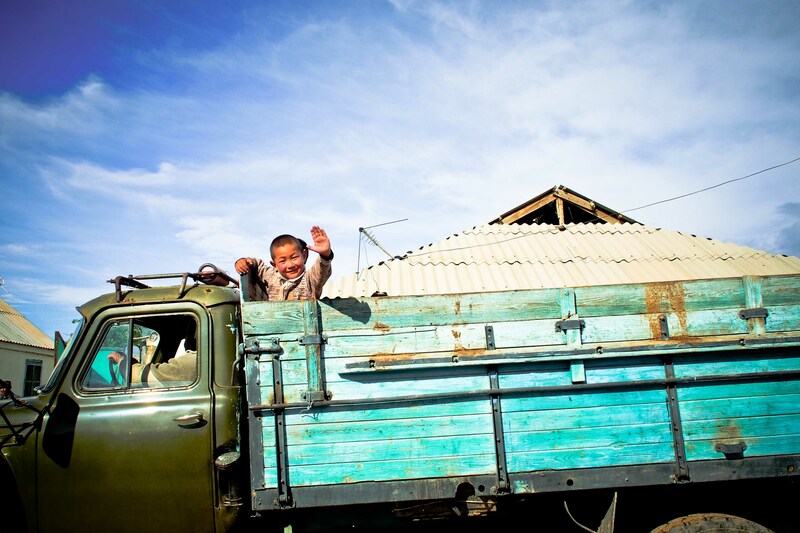 Then you will have an idea of what it was like to drive through the Karakum desert of Uzbekistan and Turkmenistan. We were a bit surprised when we payed our bill for lunch just after entering Uzbekistan and it amounted to a stack of notes almost an inch high. One US dollar is 2,300 Uzbek Som…And the largest bank note I ever got was for 1,000 Som (there are of course for even lesser amounts). People would walk around in the bazaars doing their shopping with plastic grocery bags full of money! We discovered a country that few people ever visit (because they rarely issue tourist visas), that you might not have ever heard of, but that we thought was fascinating and ridiculous. We call it Absurdistan (AKA Turkmenistan). Whats the deal with Turkmenistan? The current dictator is only slightly less eccentric than his recent predecessor, Turkmenbashi. 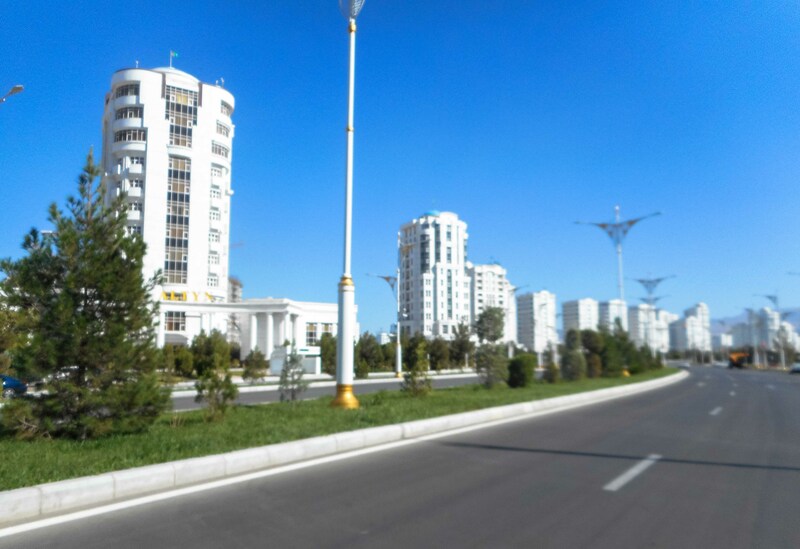 Turkmenbashi renamed a large city after himself and another after his mother, because she brought him “The Leader of all Turkmens” into the world. 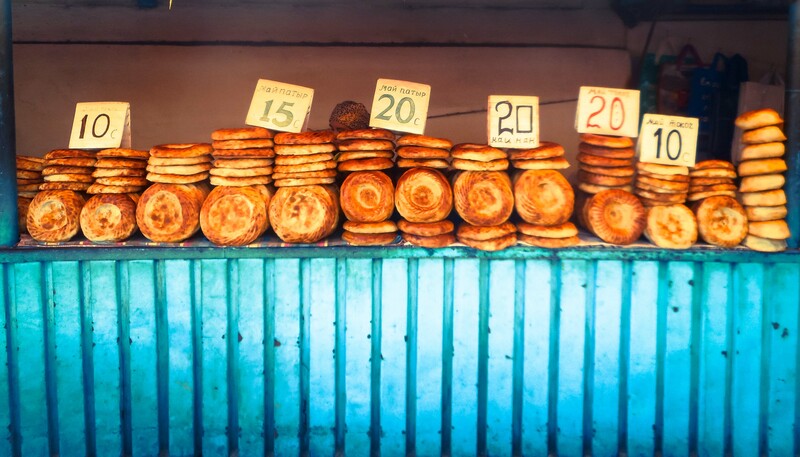 Also under Turkmenbashi, the Turkmen word for “bread” became illegal. Instead, as a homage to the life-giving powers of both bread and mothers, he made the two synonymous. His mother’s name was now the Turkmen word for bread, officially changed in all dictionaries. 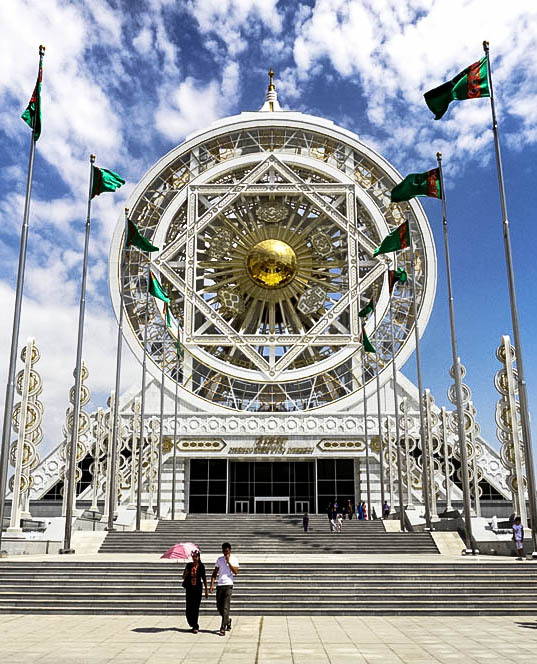 Turkmenistan sees almost no tourism. 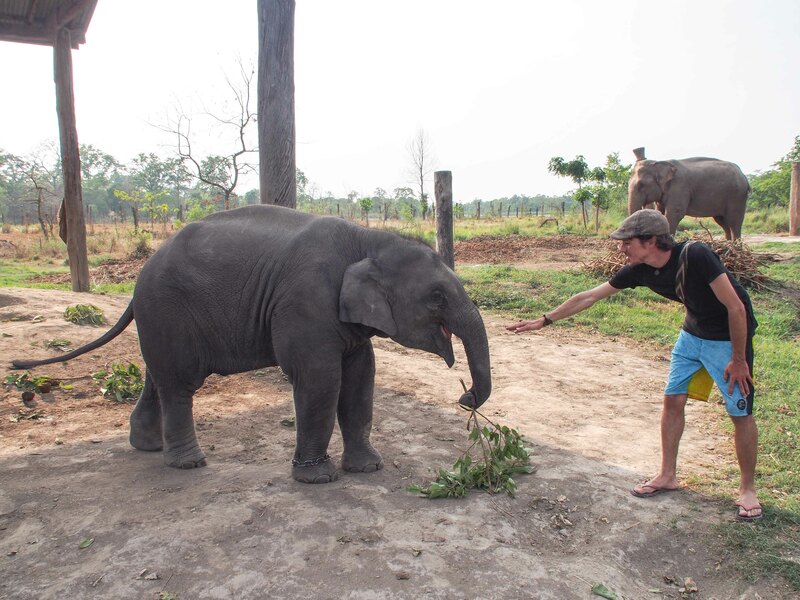 Tourist visas are almost impossible to get and if you do get one you will pay a hefty price and will have to be accompanied by a government employed “guide” at all times. Much like in North Korea. We were granted a 5 day “transit” visa. 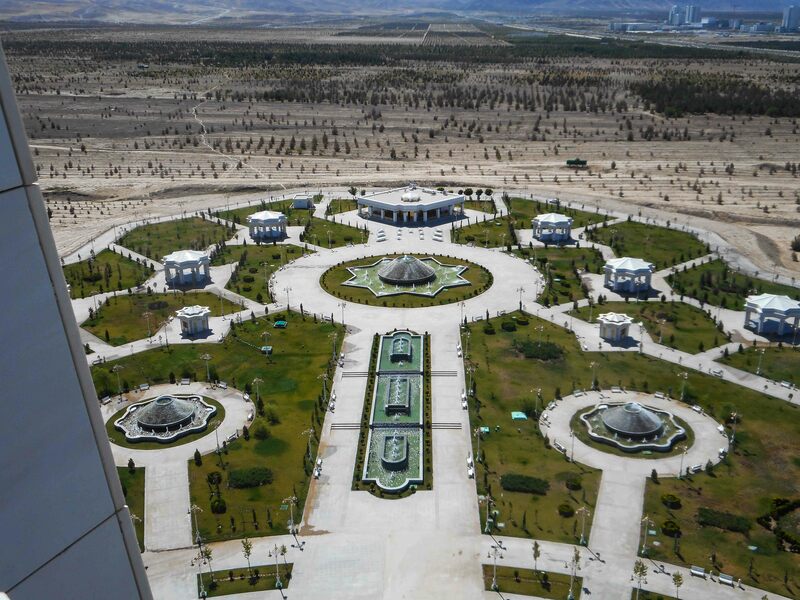 Men doing maintenance on one of the many crazy “monuments” in Ashgabat, more on that later. 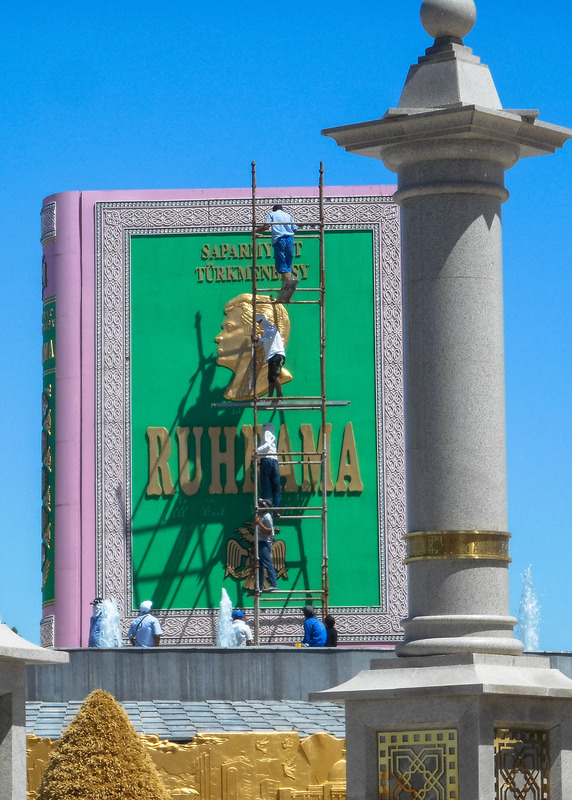 This one is a 40ft (10 meter) tall copy of Turkmenbashi’s book The Ruhnama. Every night, for an audience of absolutely nobody, it opens up and a sound and light show begins…passages from The Ruhnama are projected onto the 40ft. tall “pages” of the book. 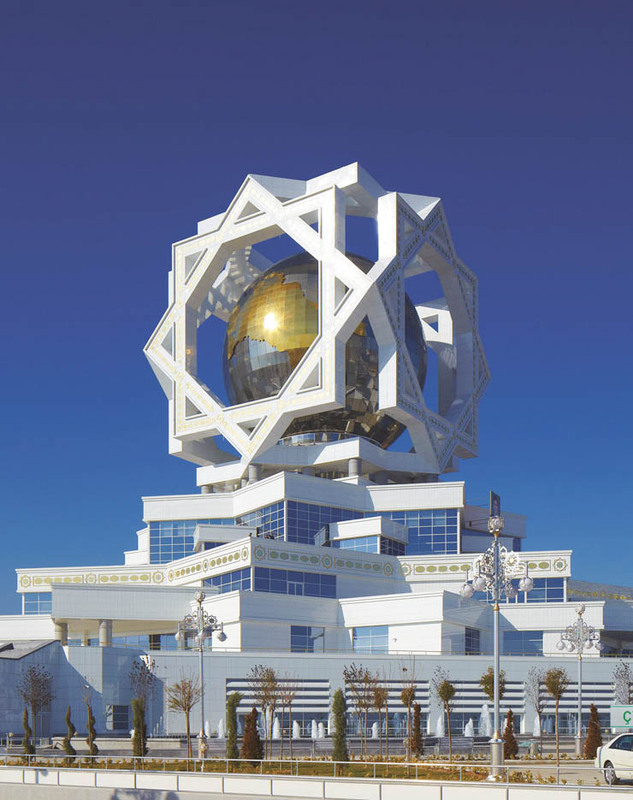 Turkmenbashi wrote a book, a “spiritual and moral guide”. He called it the Ruhnama. Mosques were ordered to teach from the book and treat it as an equal with the Koran. Students must study it in school and are tested on it. Memorization of parts of the book are required to get a drivers license or government job. Oh yea, and Turkmenbashi interceded with Allah himself who told him that anyone who reads the Ruhnama three times will be promised a place in paradise after their death. The names of the months of the year and days of the week were renamed after various aspects of himslef, his mother, and other family members. Dogs were banned in the country, as well as gold teeth, recorded music, and lip syncing. 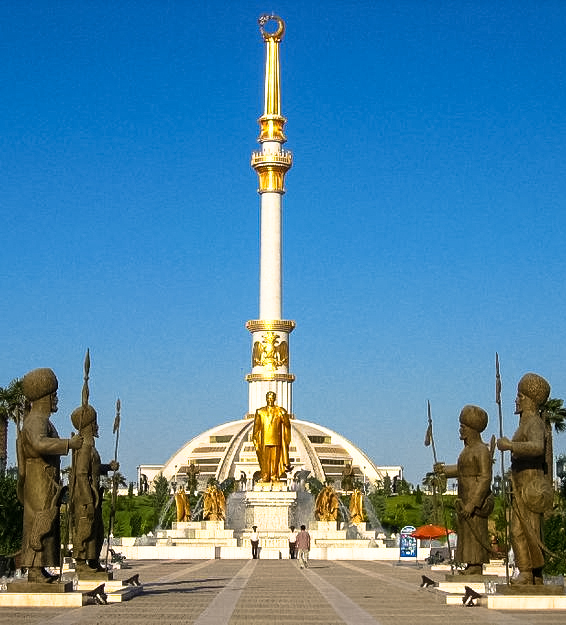 Electricity, natural gas, and water are all free in Turkmenistan. One person said that some Turkmens leave the gas on their stove running 24 hours a day to save the expense of matches. Until just a few months ago even petrol (120 liters per person per month) was free. When we filled up at a gas station it cost us a whopping 20 US cents per liter (70 cents per gallon). Women under the age of 35 cannot get a drivers license or leave the country for leisure purposes. A while back the president had heart surgery and had to quit smoking. So…he banned smoking in all public places throughout the country. The current president, a dentist by trade, decided to build a mega-resort town on the Caspian sea. He spent billions of dollars building 5 star hotels. He said it would be the “Dubai of Central Asia”. It has multiple 5 star hotels, fully staffed, and it is pretty much empty…a ghosttown. He has obviously not made the connection that for tourists to come….you need to issue them visas. Don’t ask anyone in Turkmenistan what they think of all this insanity, they wold rather rot in a dark jail cell then talk about it…because that is where they would end up anyways. Turkmenistan ranked 178th out of 180 countries by the World Press Freedom Index. 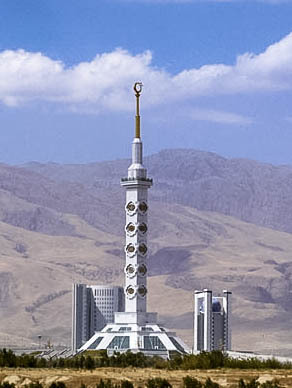 The whole city looks like Caesars Palace Casino in Las Vegas grew an ugly tumor in the form of a Central Asian city. By presidential decree all buildings are built from white marble. In fact it holds the Guinness Book of World Records as having the most white marble-clad buildings in the world — 543 to be exact. Oh, and there is no shortage of gold trim and gaudy fountains for that added “class”. In “residential” areas we drove down broad multi-lane avenues lined on each side by manicured lawns and walkways that are set before large 30 story apartment buildings (white marble of course) one after another for kilometers on either side of the avenue. In the city center there are massive white marble buildings with lavish fountains in front of each of them. Universities, ministries of this and that, sports centers, etc. etc. There are massive parks with fountains and green grass. The bizarre thing…ALL of these buildings, all the parks… are mostly empty, just there for show, I never saw a single soul walking in or out of a building . In fact the only people we did see on the streets were police (stationed every 200 meters along the road making sure you dont take photos of any buildings), and hundreds of maintenance people picking up every scrap of paper or leaf that fell on the ground. Residential street (the other side looks identical). Note there is not a single car on the road. There are dozens of absurdly bizarre monuments all over the city. What does an absurdly bizarre monument look like? View from the front of highly necessary 8 laned road to access the monument as well as the four parking lots. Within an hour of the apple incident we stop on the side of the road to eat a lunch we had packed for ourselves. A man comes out of a nearby farmhouse and asks the compulsory questions in Russian “Where are you from, where are you going, are you married, have kids….?? 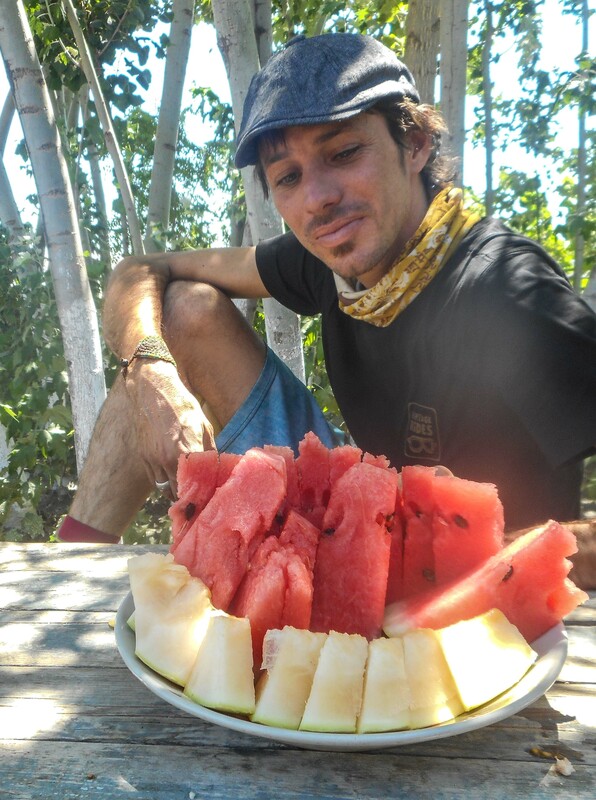 ?” He returns to his home and emerges 10 minutes later with a HUGE plate of sliced watermelon and cantaloupe, simply places it in front of us, puts his hand over his heart (a Muslim gesture of sincerity and respect) and walks away. 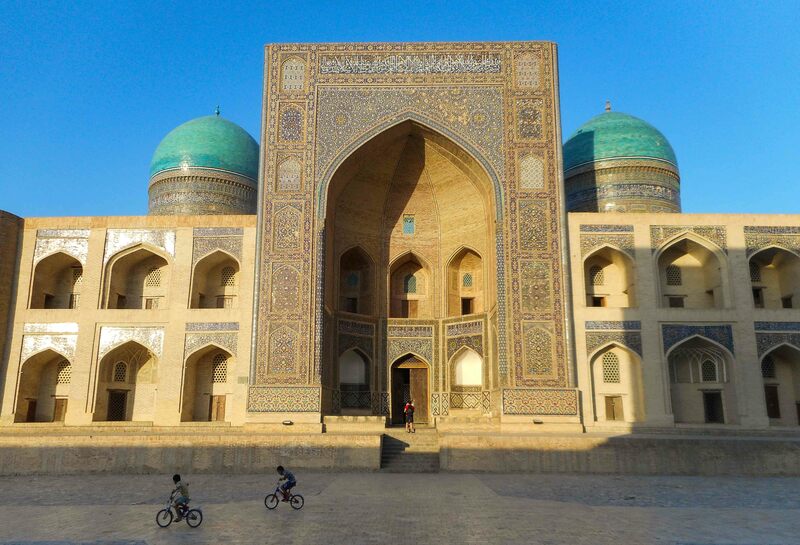 In Bukhara our friendly bartender heard we were looking for a motorcycle mechanic. I would have been happy if he gave me his name and drew me a map to find the guy. Instead, the next morning he insisted on leading me there (He also had a motorcycle and I followed him.) He translated my problems to the mechanic, then drove me back to my guesthouse BUT stopped on the way to buy a nice ripe melon, which he then presented to us as a gift. I wake up from a deep but short sleep on the train. It is 6am and it is stopped in a scraggly desert outpost. Still half asleep I stumble to the nearest door where a dozen old women are squatting in the dirt selling their food to people on the train. They see me and chaos ensues. They all start yelling at me in Turkmen competing for my business. One of them leaps to her feet and runs towards as if she were going to attack me! She is yelling in an aggressive unfriendly tone and shoving a bag of food in my chest. Dazed by the bright morning light and the yelling I say “No thank you” several times in Russian when a young train conductor appears behind me. She yells something at him in the same abusive tone, he takes the bag of food then hands it to me and says in English, “You take”. Confused as ever I try and explain that I don’t have money with me and I don’t…He stops me and says “No money. She gives”. The train began rolling away before I had had a chance to thank her. To Magdalena’s disgust and the ice-cream man’s delight,I ate 4 ice cream cones to get rid of our last Turkmen Manat (currency) while waiting for our ferry to leave. 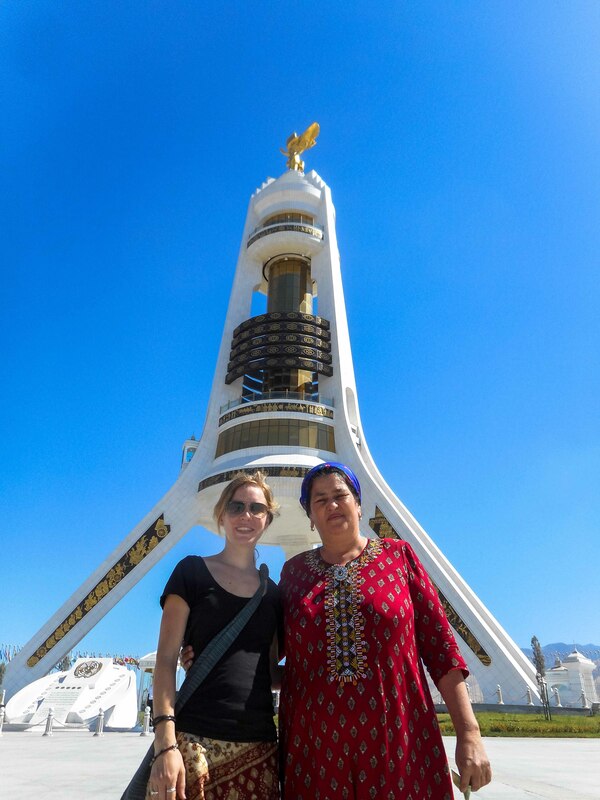 The process of exiting Turkmenistan proved to be an extensive bureaucratic circus that cost us two hours of time and several bribes to officials. 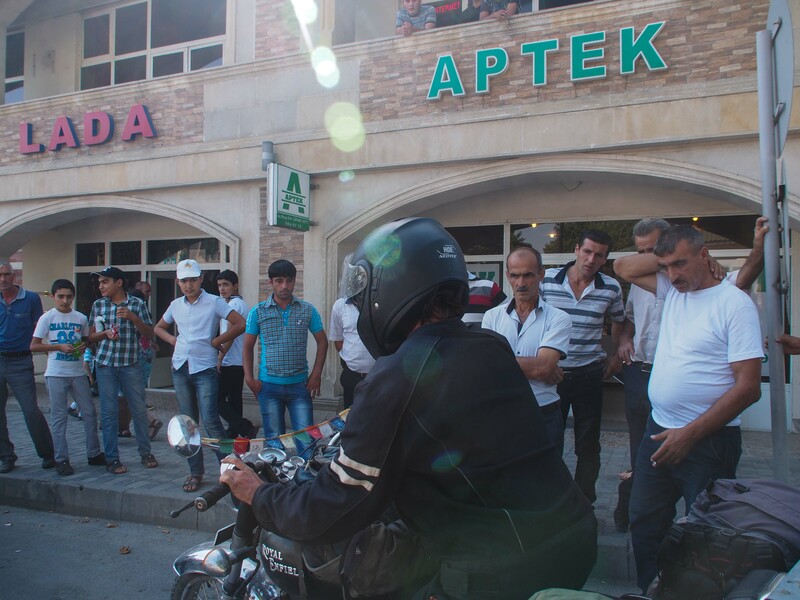 We spent some days cruising around Baku (capital of Azerbaijan), calling it “The Paris of the Caucuses”. Beautiful avenues, tasteful fountains, Parisian-style newspaper kiosks, a perfect blend of ancient buildings dating back a thousand years, beautiful 19th century classical era architecture and spicy contemporary glass and steel structures. We slept in the home of a Russian guy in Azerbaijan who used to be a patriot but eventually became a sharp critic of Russia’s government. We listened, fascinated, to his opinions of the Ukrainian conflict. Then we all sang Karaoke. 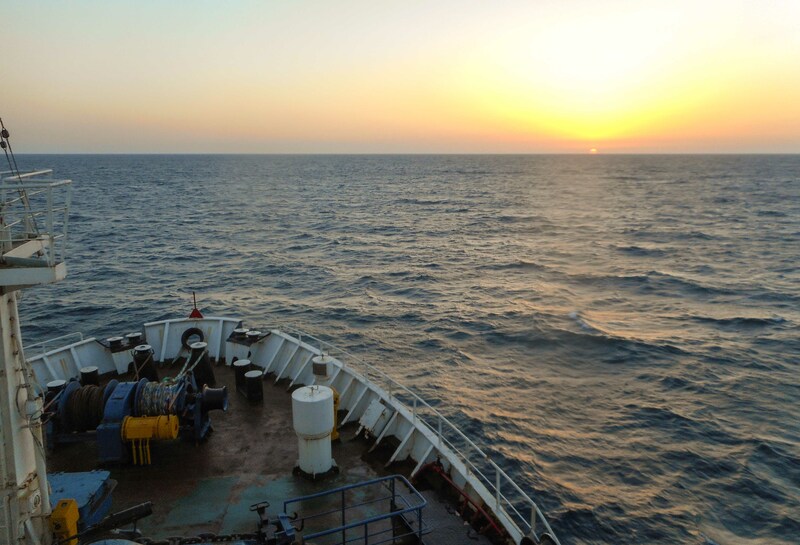 We slept in the middle of the Caspian Sea as two of 6 other passengers on a ferry that took us from Turkmenbashi, Turkmenistan to Baku, Azerbaijan. We cooked our dinner over our little beer can stove, and watched the sun set into the Caspian Sea. This entry was posted in Uncategorized on September 4, 2014 by Jordan. 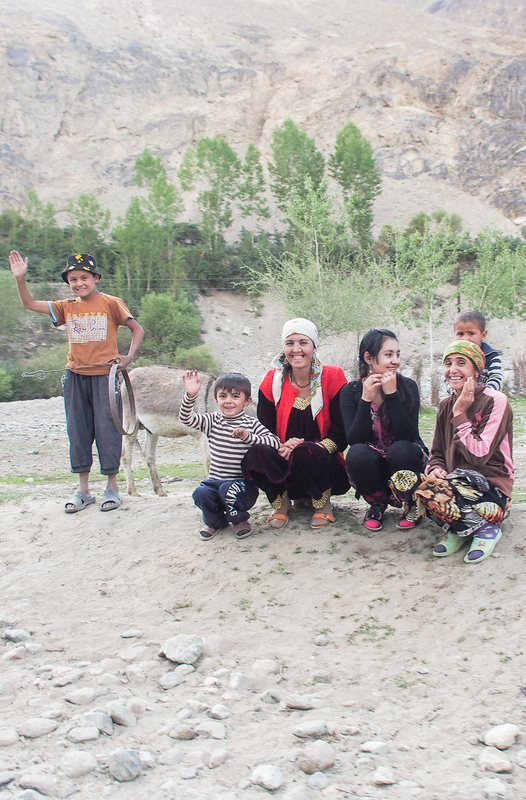 I woke up before the alarm on my phone to the sound of a donkey braying… in Afghanistan. Unzipping the door to the tent and stepping into the sunlight, the sound of a rushing river brings me into the reality of a new day. Just across the river, a literal stones throw away, is the donkey and Afghanistan. 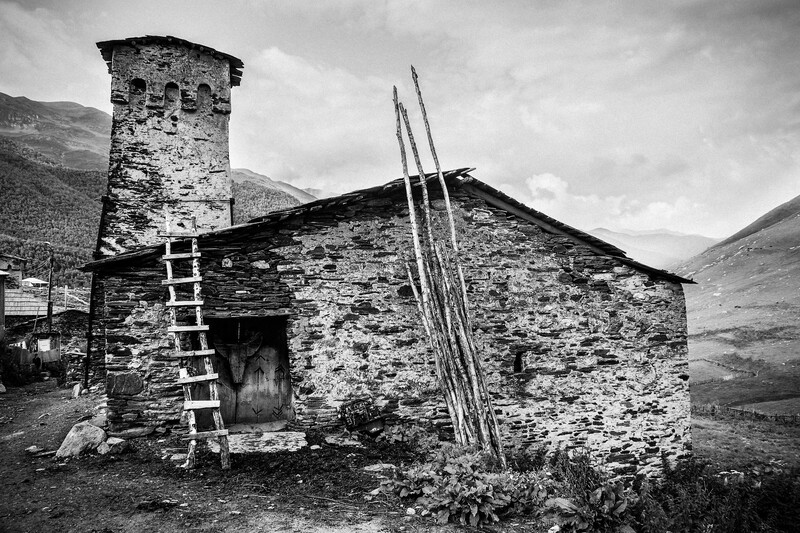 A few mud houses peppered the side of a snow capped mountain that rose up into an astonishingly blue sky. At 3,400 meters (11,200ft. ), the air is fresh and cold. 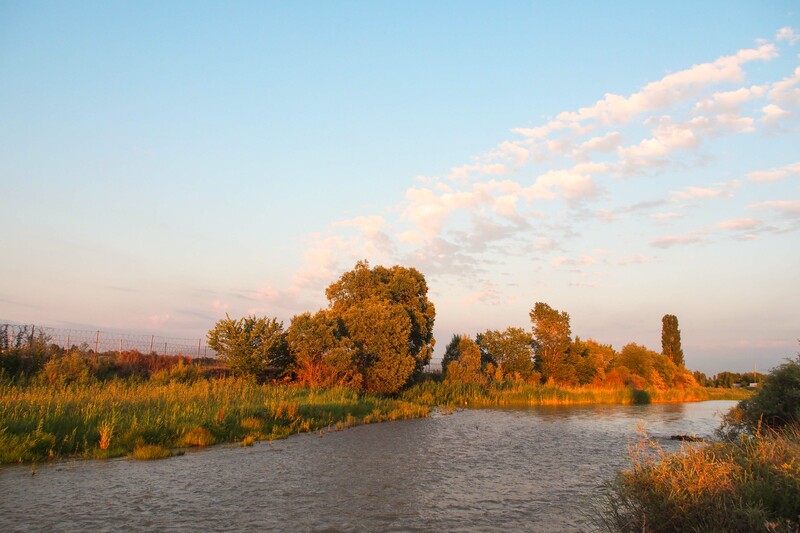 Our camp is on the Tajik side of the river. The day before, we rode on atrociously horrible dirt roads over a 4300 meter (14,100ft.) pass for a couple hundred kilometers. 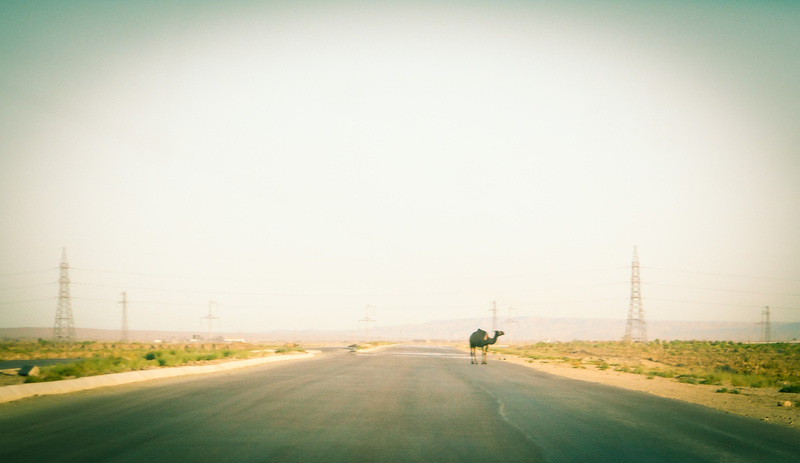 Aside from a military checkpoint that we went through, we saw only three other vehicles in 8 hours on the road. 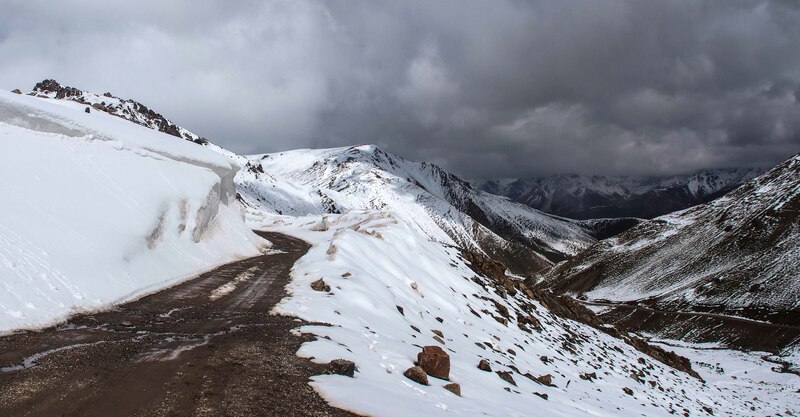 This is the Pamir Highway. Desolate, exciting, dusty, freezing cold, unbearably hot, stunningly beautiful, dangerously bumpy….. What stories have I to tell from Tajikistan…to name a few…. We past mountain lakes who competed with mountain skies for true blue. We watched the faces slowly change, the Asiatic almond eyes began to round, skin darkened, eyebrows thickened, and dark brown eyes gave way to clear blue-green. We past herds of Tajik Yaks and packs of Afghan Camels. 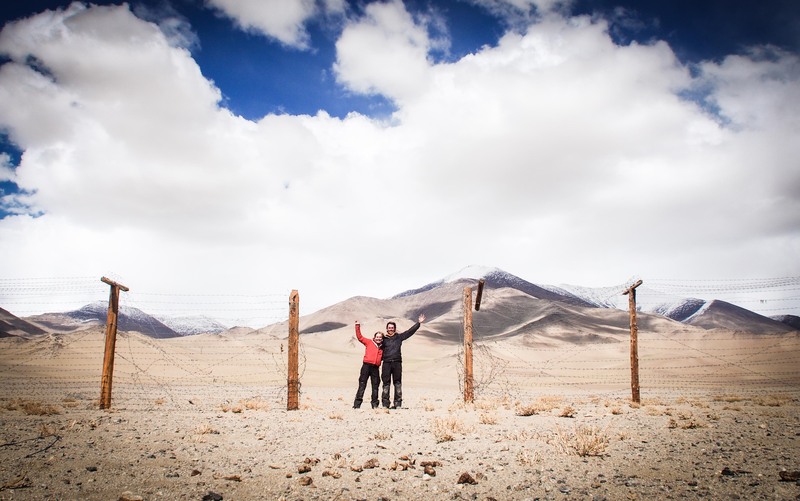 Dropping into the Wakhan Valley from the high mountains of the Pamirs we encountered some of the friendliest people I have found in all my travels. Old weather worn faces flashing smiles full of gold capped teeth, little kids wriggling with excitement like golden retriever puppies, adolescent girls with shy eyes…all waving as you pass. 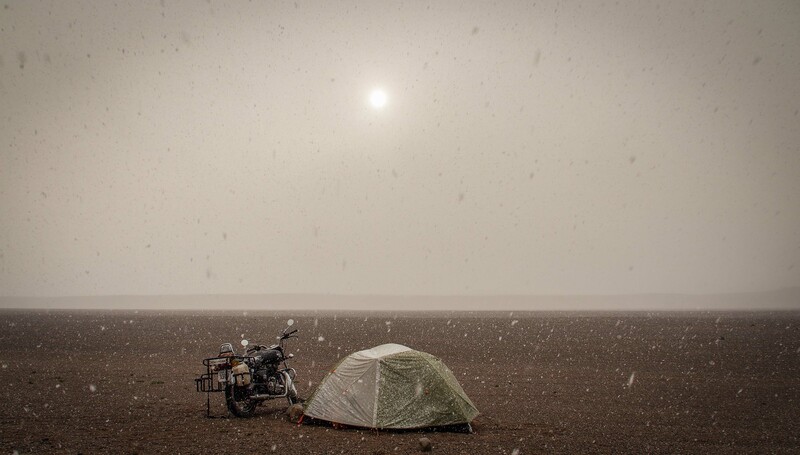 We camped at 4,000 meters, We comfortably sipped vodka while while listening to the wind blow flakes of snow and pellets of hail into the side of the tent. We were at such high altitude that we had to wait 45 minutes for our little beer can stove to cook some rice. I saw Afghan village of mud homes and was shocked to see that they all had satellites on their roofs. I wondered, are they just as excited for the new season of Game of Thrones as the rest of the world seems to be? I was not surprised to learn that the monthly wages average in Tajikistan is just $135 and 47% of people live below the poverty line. I was surprised to learn that, despite being the poorest country in the former USSR, Tajikistan has a literacy rate of 99.7%. Higher than France, Denmark, Germany, and America. Passing through another village we see three boys, maybe 10 years old in the road. A fight is brewing. One kid pushes the other who responds in kind with a slap on the face. They lock in a violent grip, one with the others shirt in his dirty little hands and the other reaching for a tuft of hair as Bala’s engine thump thump thumps closer and closer. 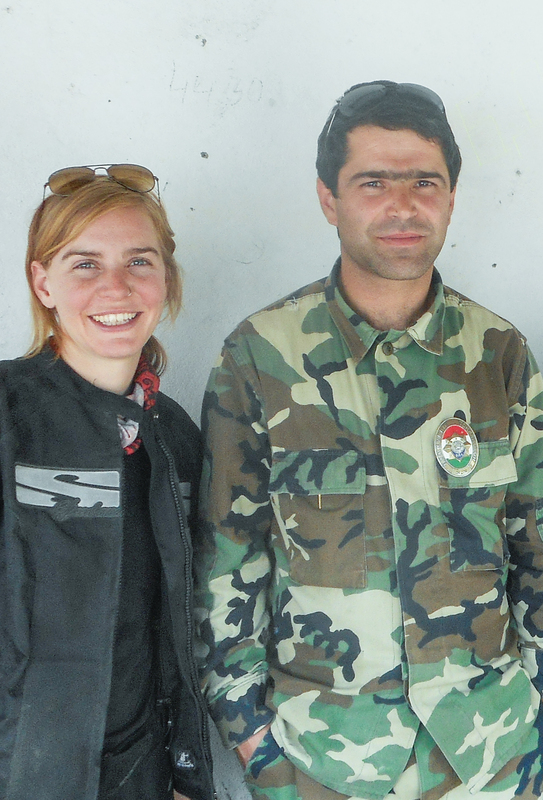 At the exact same moment they both look up, see Bala and HUGE smiles wash away their anger. They release their respective victims so the hands can wave wildly in the air as they turn on their heals to watch us pass. 100 meters after we had passed them I could still see them waving in my rear-view mirror. 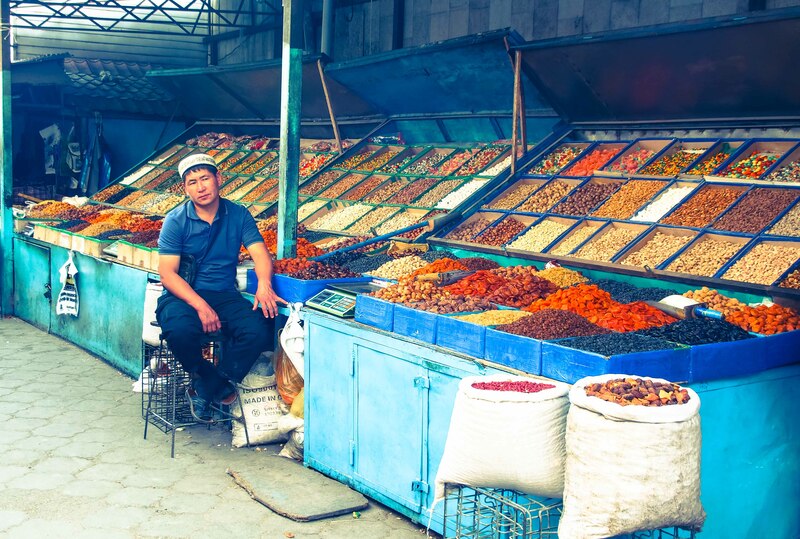 We spent over a week in Dushanbe, the capital of Tajikistan hunting for visas. We visited The Tajik Ministry of Foreign Affairs, the Uzbekistan embassy, and the Turkmenistan Embassy a total of 12 times. 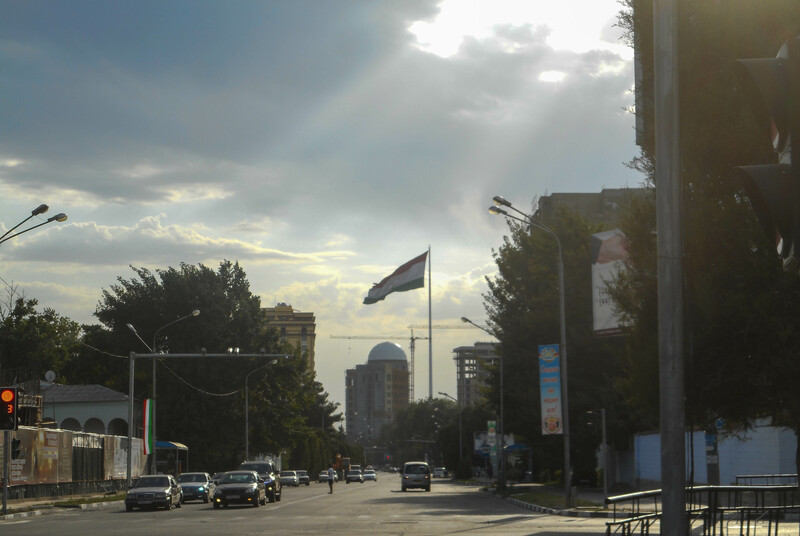 We saw the “Worlds Tallest Free-standing Flagpole” in the middle of Dushanbe, proud may they be. We found an Indian restaurant and re-lived some happy days. We discovered that Tajiks are completely crazy about watermelon. It is EVERYWHERE. 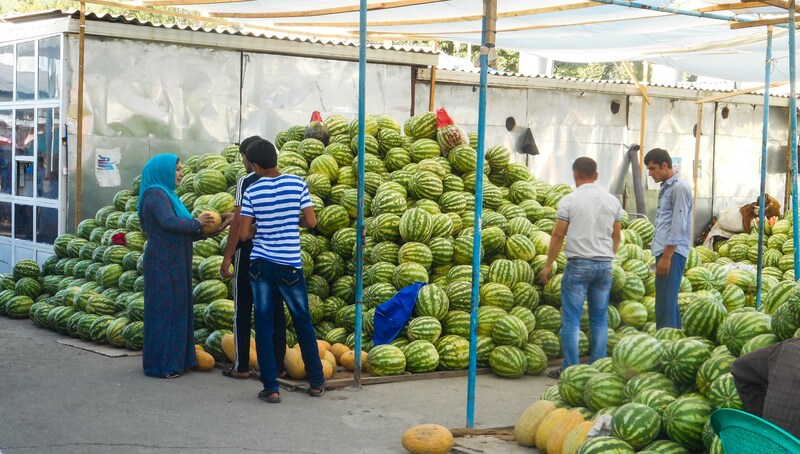 Just as in France you see people walking around everywhere with baguettes under their arms, In Tajikistan everyone on the street seems to be carrying a watermelon home. That’s all I have to report for now. This blogpost comes very late (due to busted computer)…we are already in Georgia but I will hopefully get another post out soon to try and get caught up. This entry was posted in Uncategorized on August 5, 2014 by Jordan. 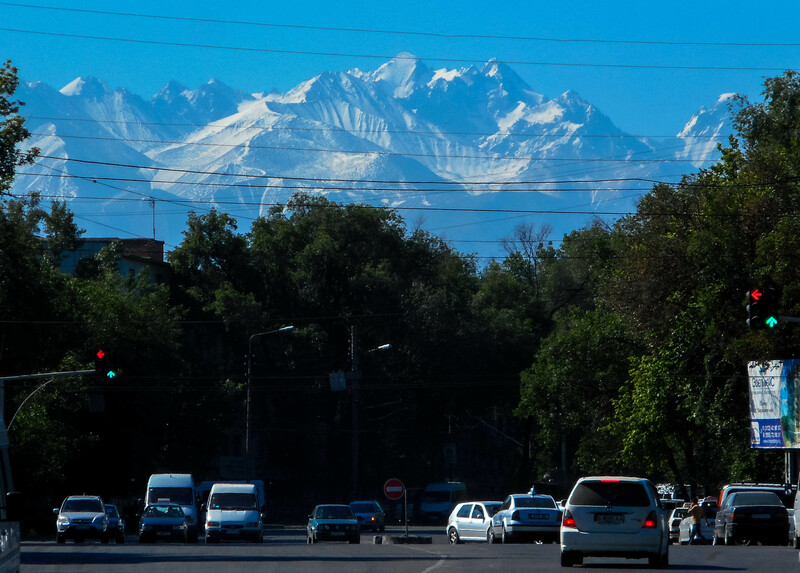 Arriving in Bishkek from India I experienced the most extreme culture shock in all my traveling years. A bright and clear late afternoon sun shone across open fields of green agriculture as we drove from the airport into the city. A pedestrian stepped into a crosswalk and our taxi driver stopped for them!!! Little white puffs of cotton sauntered down through the rays of sunshine from the branches of cottonwood trees creating a fairytale-like atmosphere ….cottonwood trees with green leaves on them….GREEN LEAVES I TELL YOU! Observing a street corner as our taxi waited at a red light, not a stray dog was to be seen nor a car horn to be heard. No dust in my eyes, no trash on the sidewalks, no cries of the Chai wallas selling their brew. India is behind us (and already very much missed), new adventures await. We participated in the circus of getting Bala cleared through customs. We ran around from one customs office to another collecting a myriad of forms. We were not free to go until we had acquired the requisite number of bureaucratic stamps to be added to our forms. The magic number: 15. We said goodbye to Hinduism and Salaam Alaikum to Islam. 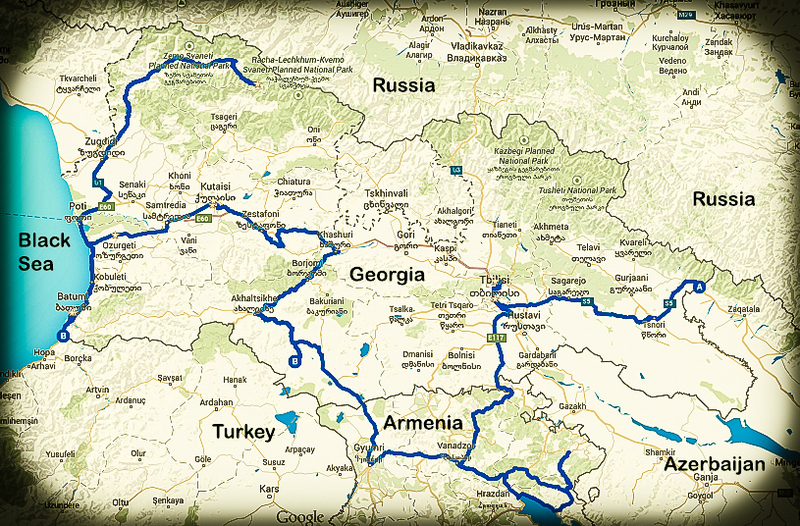 For almost a week we stayed with a couple from the UK and Latvia who bought an old Russian Ambulance in Georgia (the country not the state) and struck out for Mongolia. They ran out of money in Bishkek so for now call it home. They put a roof over our heads and sent us off with a wealth of advice for the road we had ahead. I re-learned how to drive on the right side of the street. Even though strangely enough, half of the cars in Kyrgyzstan have the steering wheel on the right. While still in Bishkek, after a major mechanical scare, we thought Bala had died. We had a brief a panic attack, and then when she was resuscitated with the help of a local mechanic we vowed that we would not be so quick in the future to doubt her resilience. 20 days and 1000K (625miles) later our vow was put to the test as we crawled into the city of Osh, practically pushing Bala, she was so sick. 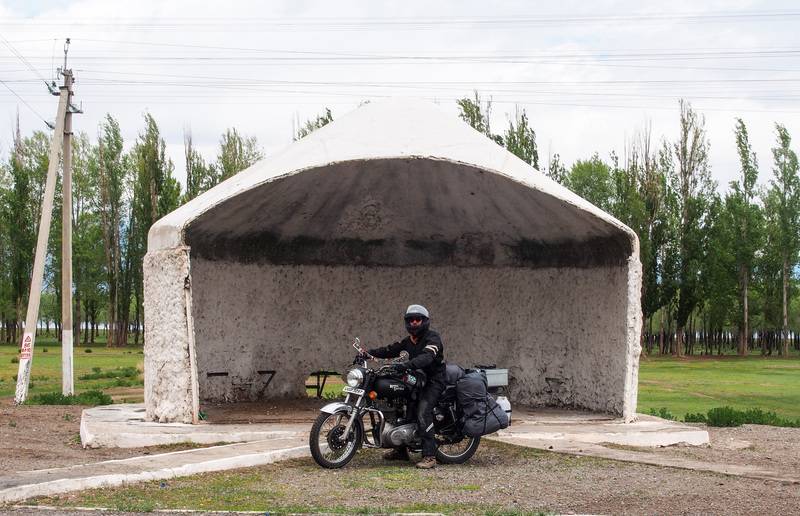 We were saved by some Swiss expats who rent motorcycles to tourists in Kyrgyzstan. They loaned us tools, mechanics, and a place to work. Problem solved. Thanks Muz Too. 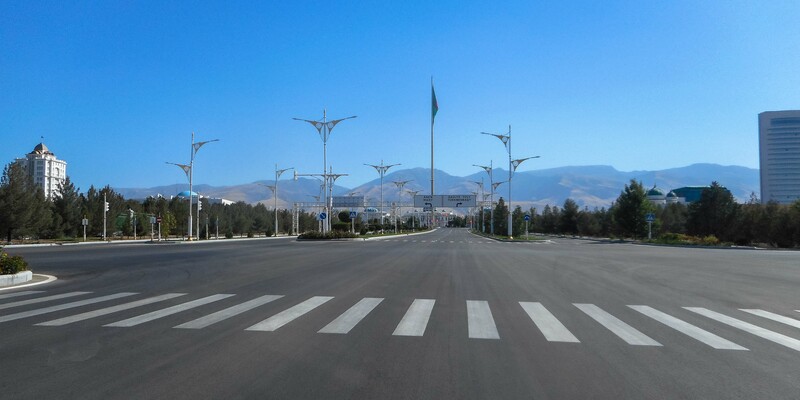 We spent over a week in Osh, the second largest city in Kyrgyzstan, dealing with mechanical issues. 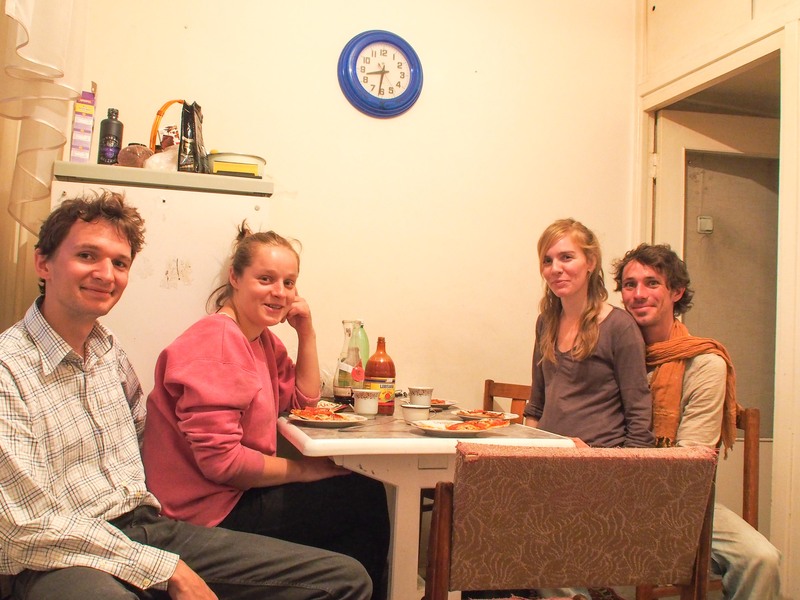 We met Laura, Chris, & Arjens, veteran overlanders. They accepted us into their club and we spent a week eating cherries troubleshooting motorcycle problems, and waxing geographical. 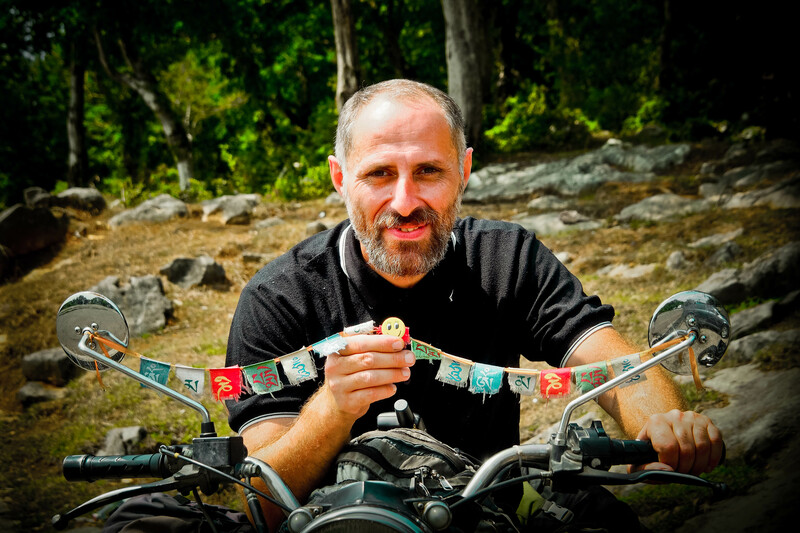 Our speedometer and odometer broke while the bike was in transit from India. Time stands still. We take things slowly as they come….very slowly. And I can’t figure out how we keep waking up in new places even though we haven’t moved one kilometer in weeks. You can buy beer in two liter plastic bottles. The vodka section in a Bishkek supermarket is bigger than the cereal section in a New York supermarket. 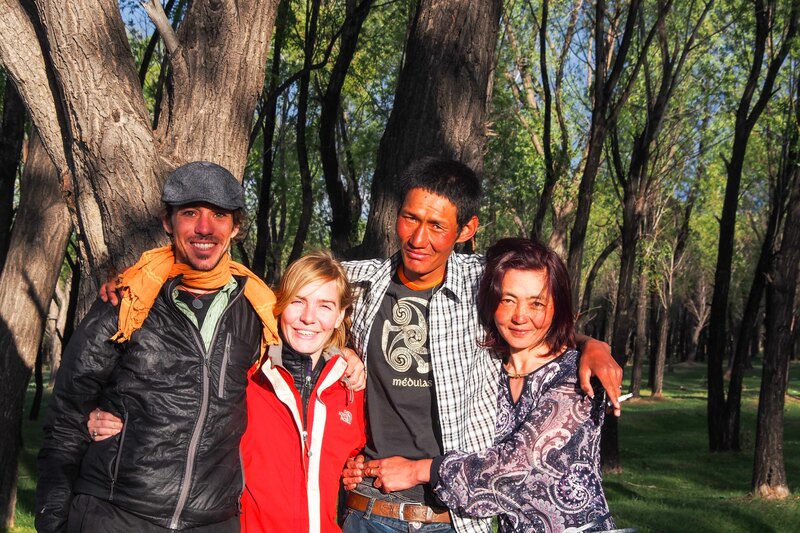 Not surprisingly we saw a lot of alcoholism in Kyrgyzstan. Very normal to see guys throwing back tall glasses of vodka at 9am then jumping into their cars and proceeding to swerve between lanes. Don’t worry Dad, I drove very defensively. Handshakes are very important. You shake hands with everyone. Just the other day I shook the guys hand who filled our tank at the petrol pump. Number of people in Kyrgyzstan: 5 million. Number of sheep in Kyrgyzstan: 8 million. 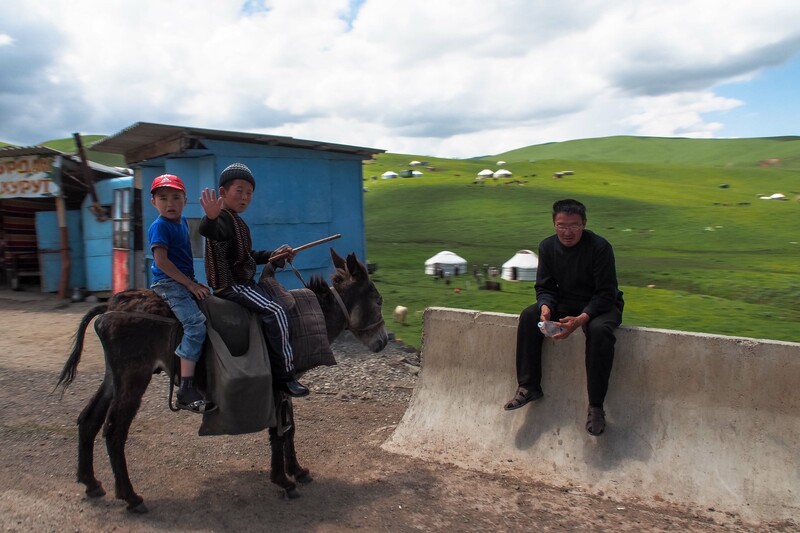 Bride Kidnapping is a big part of the rural culture here and widely practiced and accepted. Men kidnap a woman off the street (often in broad daylight) who they wish to marry. The woman is brought back to the man’s home where his mother, grandmother, aunts, etc. try to force a ceremonial headscarf on the women’s head. After hours of wearing her down they usually manage to get it on….and that’s as good as a marriage license. Of all the countries in the world, Kyrgyzstan is the furthest away from a sea port. We camped next to hundreds of sheep. Of course I tried to make friends. We camped next to rivers. We camped next to lakes. We camped surrounded by snowy mountains. We camped 20 meters from the Kazakhstan border. We ate the local foods… lagman (thick noodle soup), goulash, monte (fatty meat and onion dumplings), dried/aged horse milk cheese balls (which we discovered aren’t half bad if grated over our tent-made pasta), shashlik (grilled skewered meat), lagman, and lagman. While taking in a sunset next to a lake were approached by a local couple who we gathered were having an affair unbeknown to their wedded counterparts. We used our bicycle pump to inflate their flat car tire. Next thing we know they have purchased such necessities as: A bottle of vodka, two liters of beer, a pack of cigarettes, and some ramen noodles…and as the air slowly escaped once again from their newly pumped-up tire, we spent an entire evening until just before midnight eating, drinking, and merrymaking with our new friends (who, by the way, spoke no English). Road to Song Kul Lake. Yes, Bala is a badass. 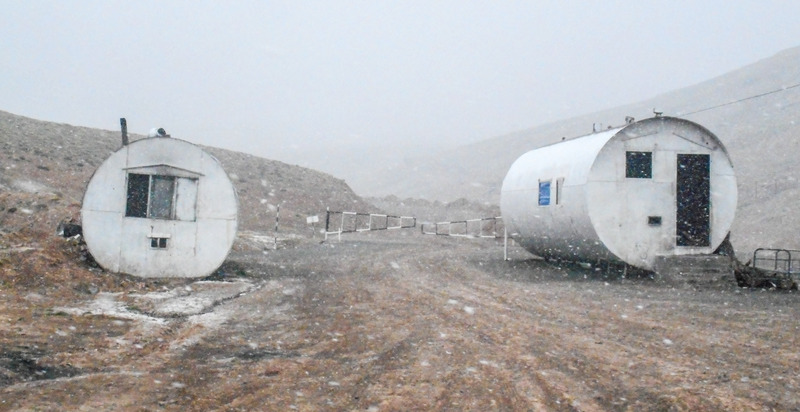 Bala’s oil pip began to leak. We found a Russian refrigerator repairman with a weathered face and friendly vodka whetted smile who did a pro job of welding a piece of refrigerator pipe to replace the broken part of ours. The next day we blew a fuse. No auto part store carried what we needed. Someone suggested a TV repairman. We found the guy, he had the part, it fit perfectly. So Bala is now part refrigerator and part Television. I’m sure that by the time she reaches Spain she will have a bit of toaster and microwave in her as well. 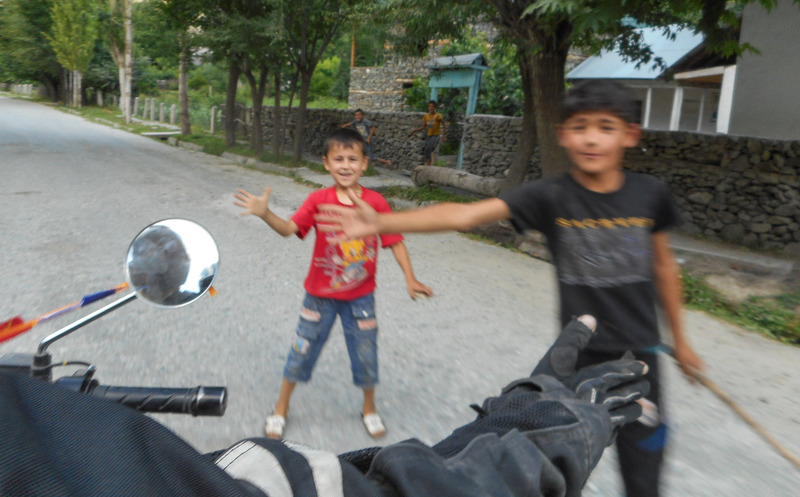 Everywhere we went, at the sight and sound of the motorcycle roaring down the road, little kids would run as fast as they could from the doors of their homes and yurts to reach the side of the road where they would great us with huge smiles and little dirty hands waving in the air. Caught driving on a muddy road in the middle of a rain and snow storm we came across an encampment of mine workers who invited us into their little canteen. 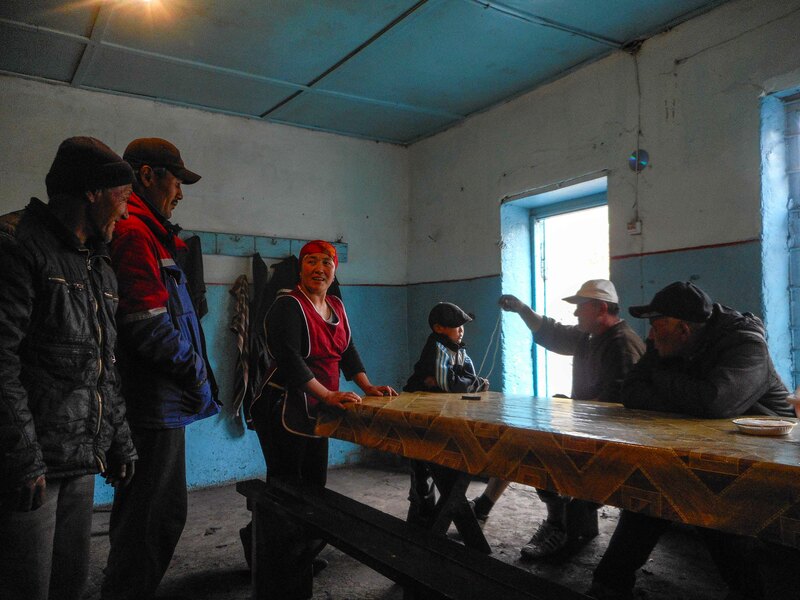 They fed us soup, tea, and fermented horse milk and gave us a warm place to dry our clothes. As a sidenote: As I drove away from the camp with the pungent taste of fermented horse milk lingering in my mouth…I thought about it….horse milk….I have seen plenty of cow udders so why haven’t I ever seen a horse udder? Or would it be called a teat? Have you ever seen a horse teat? After blowing a fuse the Russian TV repairman who came to our rescue would not accept payment…he only said, “Just remember me in your travels” and gave a me what was as close to a smile as one could expect from a Russian TV repairman. 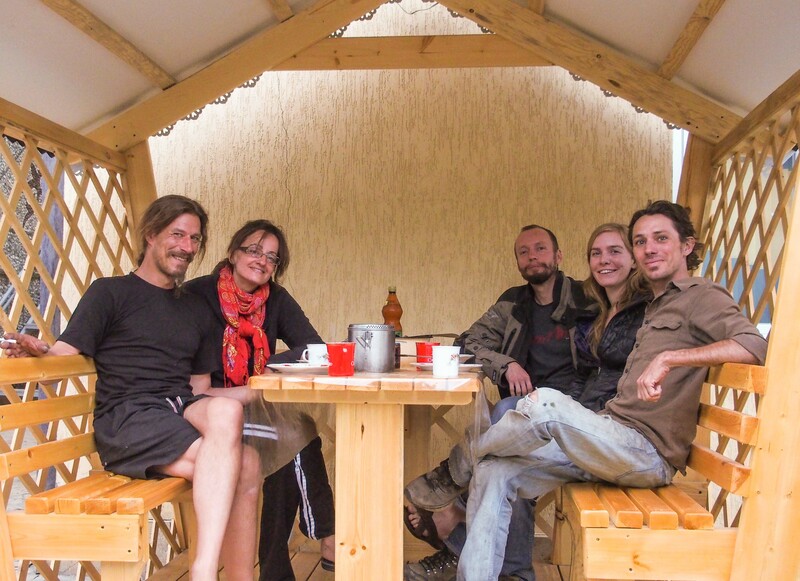 While filling up at a petrol station we were approached by two gregarious Canadians who have been working for a Canadian gold mine in Kyrgyzstan and living there for years. With a storm looming on the horizon they took a look at our pathetic preparations and kindly invited us into their home which, to our weary traveler bones was more like a palace. We spent two evenings with them feasting, drinking and swapping stories. This entry was posted in Uncategorized on July 5, 2014 by Jordan. This entry was posted in Uncategorized on June 25, 2014 by Jordan. 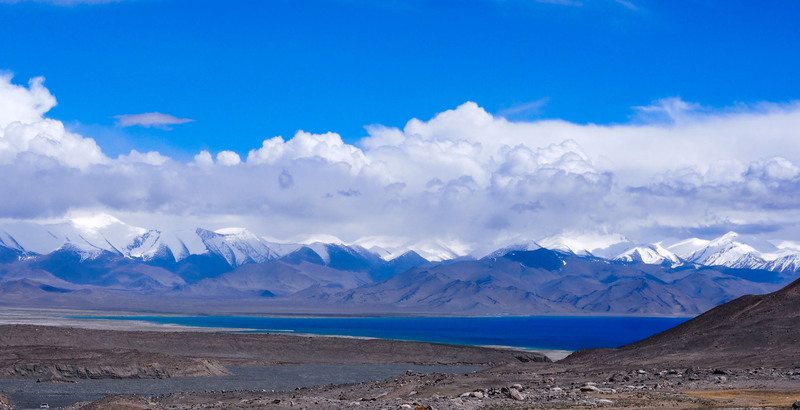 Song Kul Lake. Video Short. 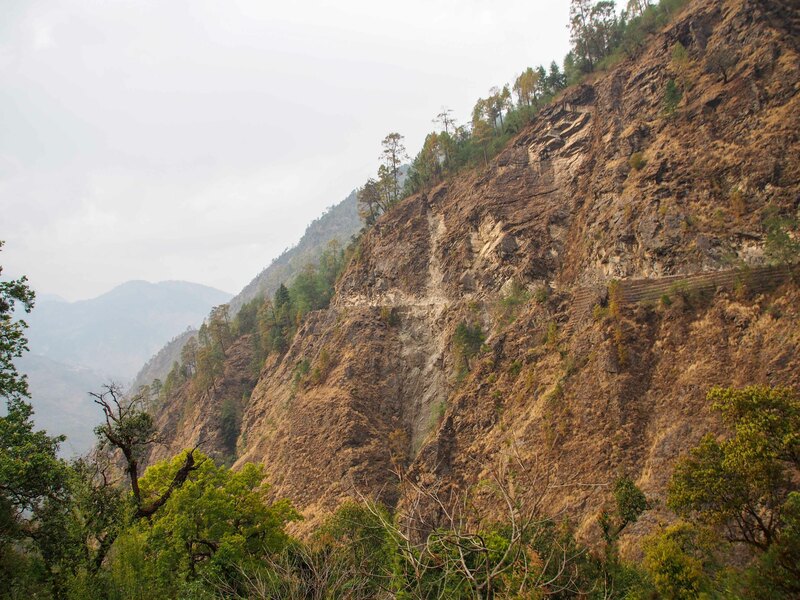 We climbed up and up…to 3,500 meters (11,500 feet)…Bala began to suffer, crawling up the hills…a mechanical issue we thought we had taken care of back in India was back. 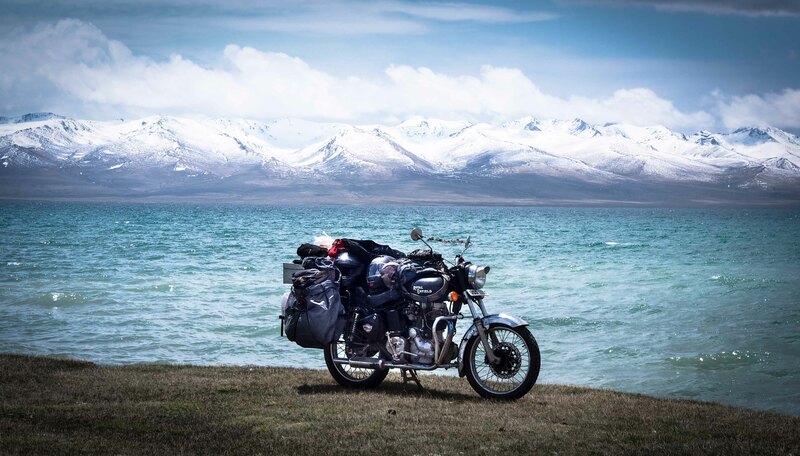 The destination: Song Kul Lake. 4 days, hundreds of kilometers of muddy and icy dirt roads, 5 river crossings, a few dozen yurts, hundreds of sheep and horses, and almost NO PEOPLE! 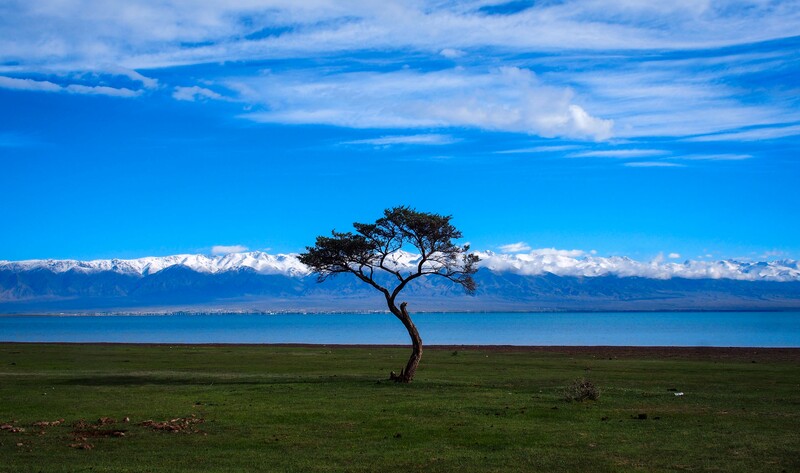 there are only a dozen or so families of Kyrgyz nomads that inhabit the lake. The day we left Song Kul we drove for 5 hours before we saw another car. 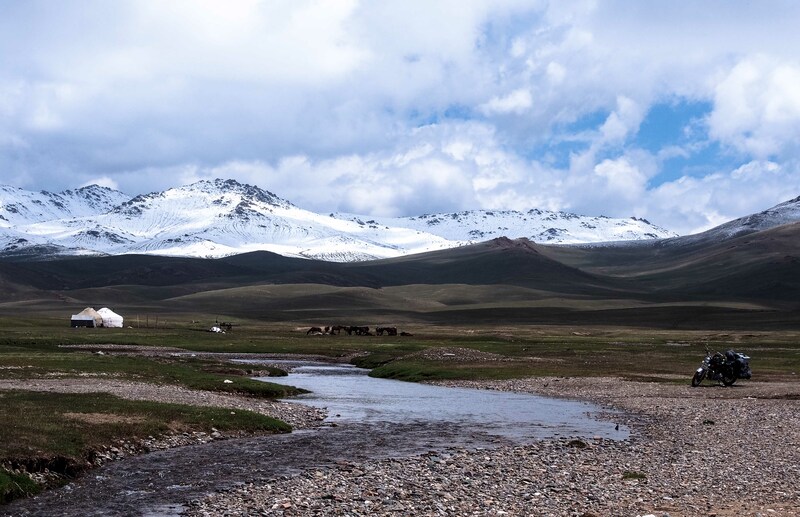 I didn’t have time to put together a full blog report yet on our time in Kyrgyzstan before we head off today to cross the Tajikistan border, but I thought I would share this little collections of video from our time around the Song Kul region. PS: If you are in the charitable mood don’t forget my fundraiser…donate to causes like conservation, worldwide poverty, and cancer research and I will send you a postcard from somewhere along the way as a thank you…more details on how to donate by CLICKING HERE. See you in Dushanbe. This entry was posted in Uncategorized on June 16, 2014 by Jordan. Click on map to be brought to GoogleMaps for a better view. Red line was by train, the rest is by temperamental vintage motorcycle. 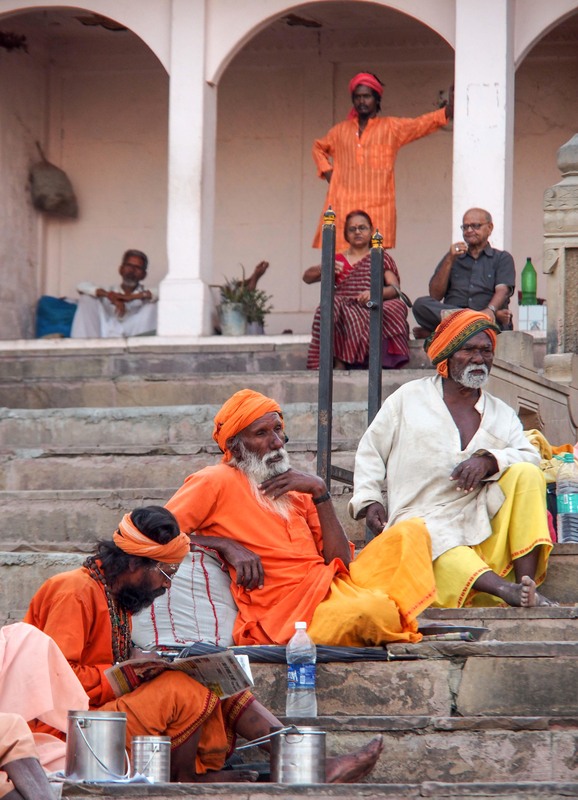 We did a swan dive into everything that makes India extravagantly mystic, surreal, overbearing, sacred, grimy, and unceasingly captivating in Varanasi, one of the oldest cities in the world. It was one of my favorite places I visited in India. On our train journey from Delhi to Gaya we lost Bala (she was supposed to be on our train). For 24 scary hours we had no idea where she was. After some funny interactions with the railway stationmaster we found her….800 kilometers away. 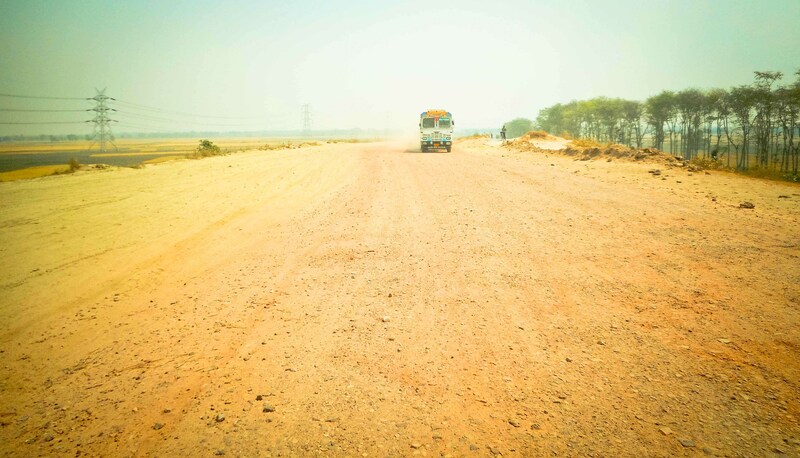 Border crossing experience 1: India to Nepal, Southern border. A cacophony of chaos. A blizzard of dust, rumbling trucks, horse-drawn carriages, and disorder. 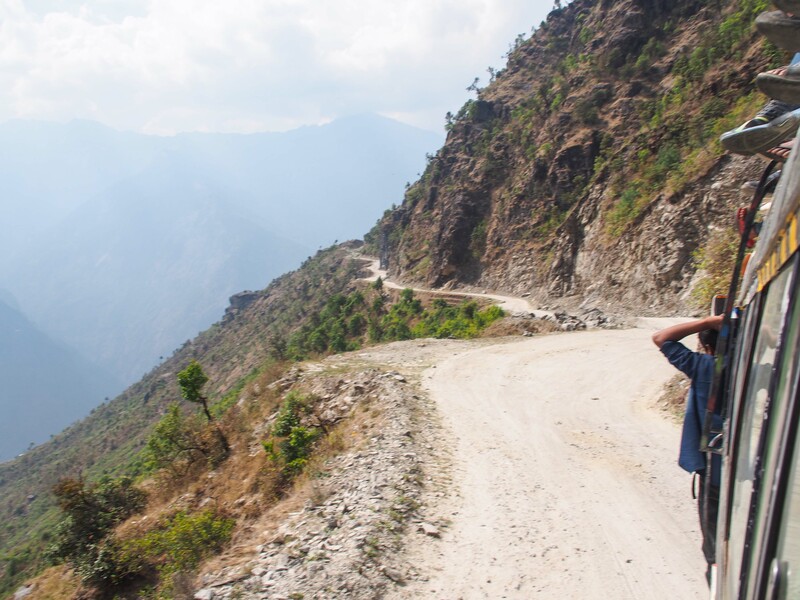 Border crossing experience 2: Nepal to India, Western Border. We had to wake up the sleeping Nepalese immigration officers. There was not a single person, car, or motorcycle crossing the border. 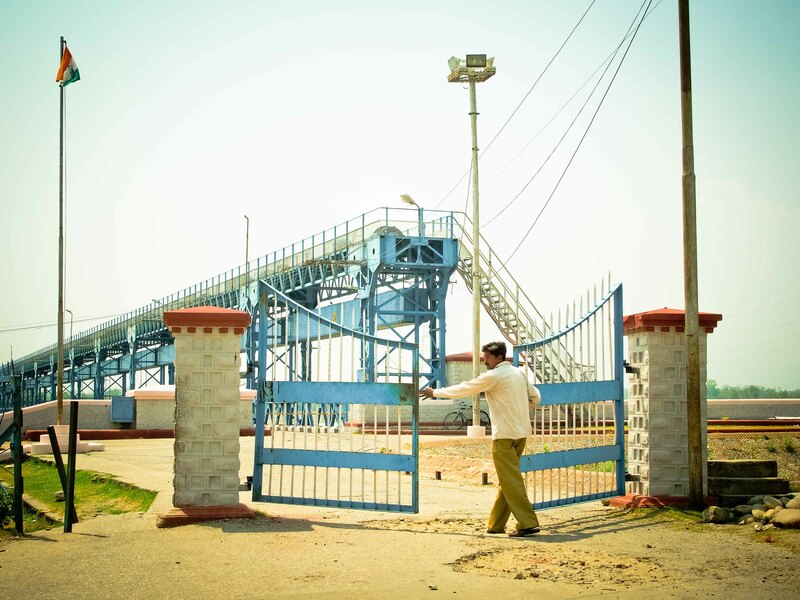 A man literally had to come “unlock the gate to India” for us so we could pass through. 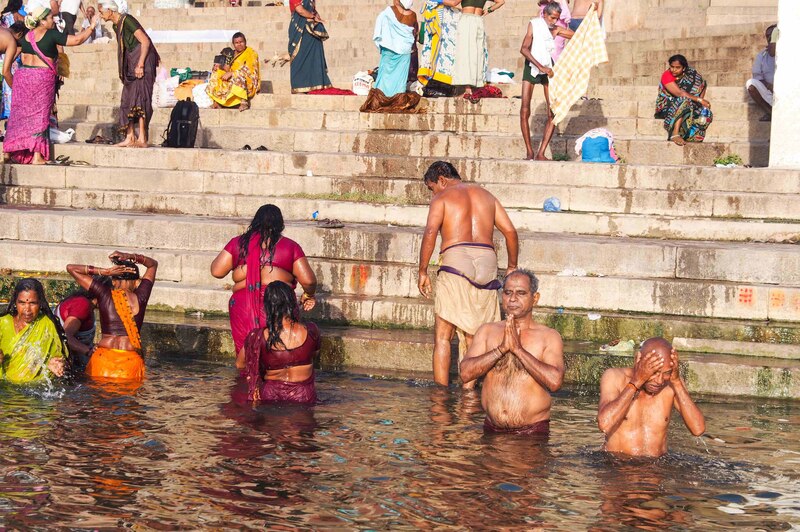 We witnessed true devotion to faith…hundreds of people bathing in and drinking the water of the sacred Ganges river… where the level of coliform (human and animal feces) is TWO THOUSAND EIGHT HUNDRED TIMES!!! the level which is considered safe by the World Health Organization. Now that’s devotion. Thankfully the newly elected prime minister of India is launching a major cleanup mission for the river. 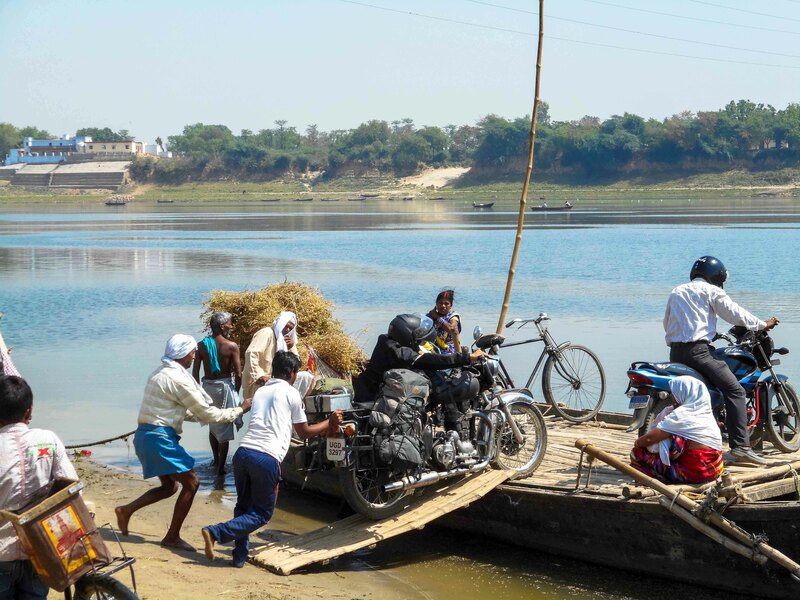 We crossed the Ganges 4 times on Bala in four different places, once we were rowed across on a boat. We spent 8 days hiking up the Langtang Valley in the Himalayas near the border of Tibet. In Kathmandu I applied for my third India visa in 8 months. 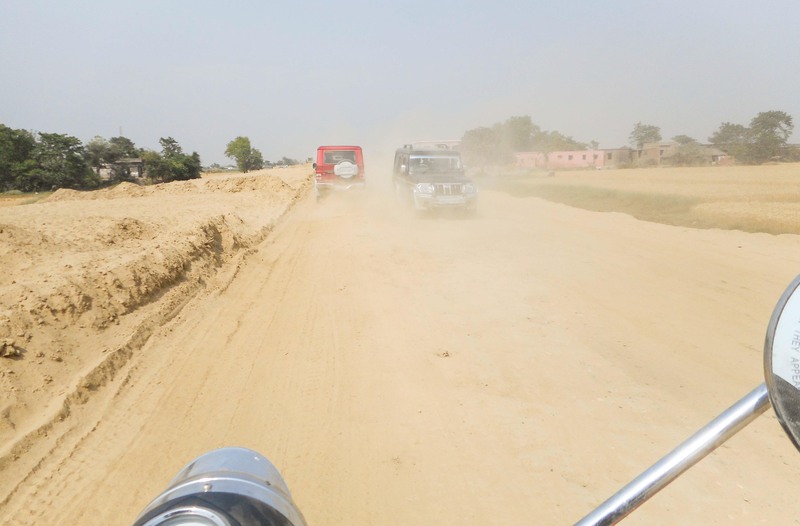 We passed through a very inconspicuous dusty city in Bihar, the poorest state in India, called Motihari. We were shocked to discover that it is the birthplace of author George Orwell. At the Iranian embassy in New Delhi we had a nice chat with Freddie Mercury’s cousin. 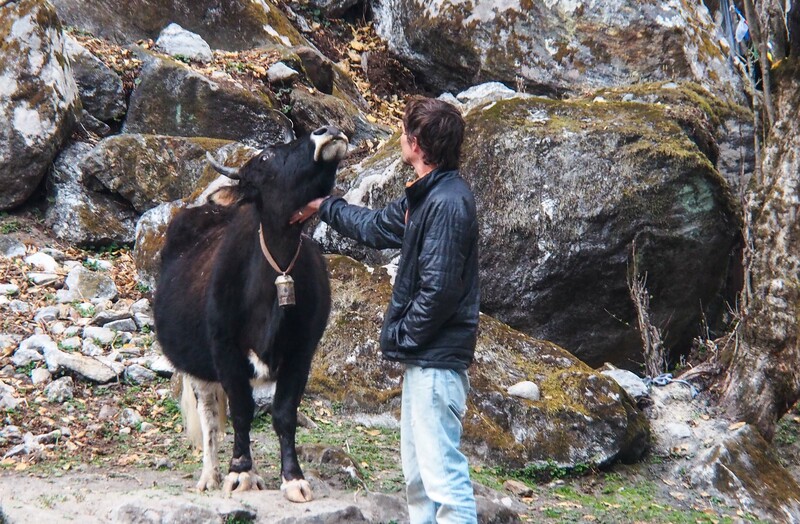 I made friends with Yaks. We watched a procession of men carry a body to the banks of the Ganges, place it on a pyre of wood and set it ablaze. As the sun set into the river we watched the fire burn and the smoke rise for two and a half hours until all that was left was a small pile of hot coals. The day that we drove into Kathmandu I was scandalized by how the women dressed. I found adjectives like “Slutty, promiscuous, and scanty” popping into my head. Until I realized that they were just dressed like any normal woman you would see on the street in America or Europe! That’s what seven months in ultra-conservative India can do to you. We ate dodgy fish at a restaurant on the shores of the lake in Pokhara and I suffered the consequences for days after. We hiked to an ancient glacier high in the Himalayas. 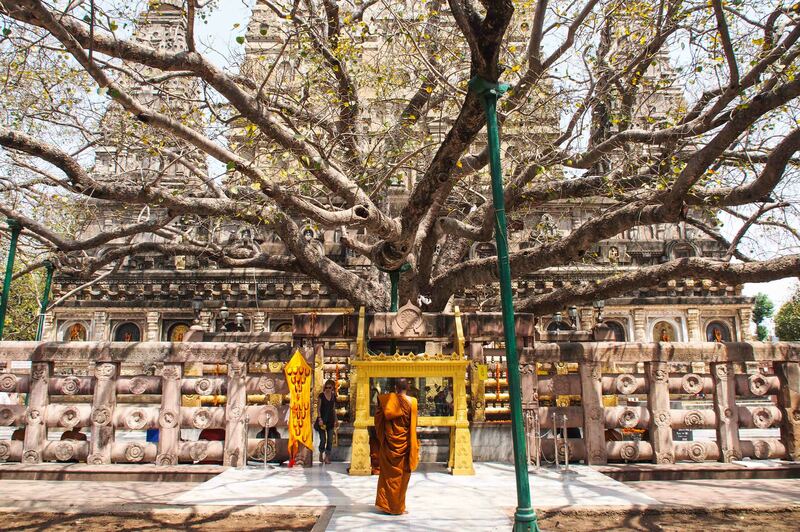 In in a dusty town in Northern India called Bodhgaya, we mingled with Buddhists pilgrims, soaking in the nirvanic vibes that fall like leaves from the branches of the Bodhi tree where, 2500 years ago Buddha found enlightenment. This tree is thought to be a direct decendant of the actual Bodhi tree that Buddha was sitting under when he achieved enlightenment. The day that we cruised back into Delhi, the World Health Organization released a list of the 20 most polluted cities in the world…guess what was number one. 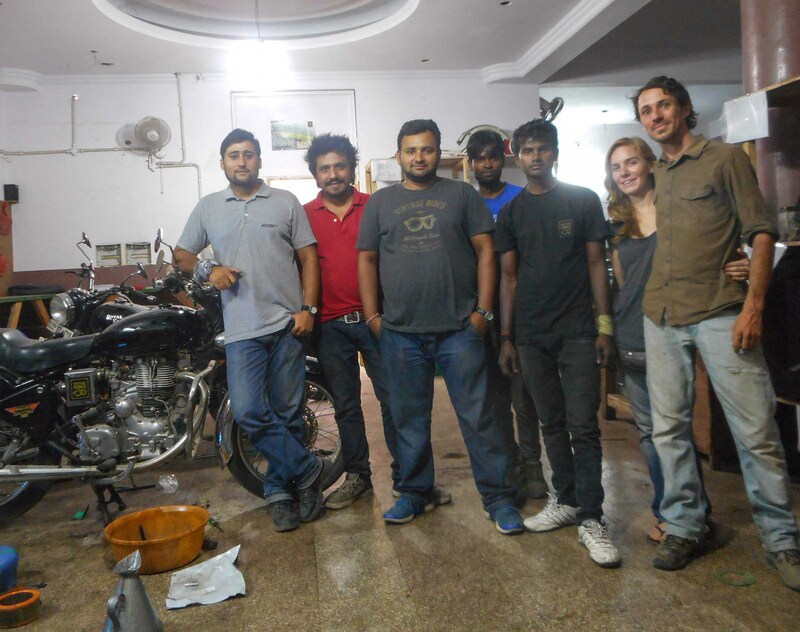 We said goodbye to the team at garage team at Vintage Rides, who were instrumental in making this whole trip a reality. Right down to the last minute. Back in Delhi we spent a very hectic week and a half preparing for our final departure from India. Mechanical work, organizing spare parts for the journey west, catching up with old friends, and getting Bala boxed up for the trip to Bishkek, Kyrgyzstan. We said goodbye to India (with a tear in the eye) and boarded a plane to Kyrgyzstan. It’ll be all overland from there. 14,000 kilometers (8700 miles) to go. Bala is in good shape. We are excited for new places, faces, and roads. The journey west begins. This entry was posted in Uncategorized on May 23, 2014 by Jordan.